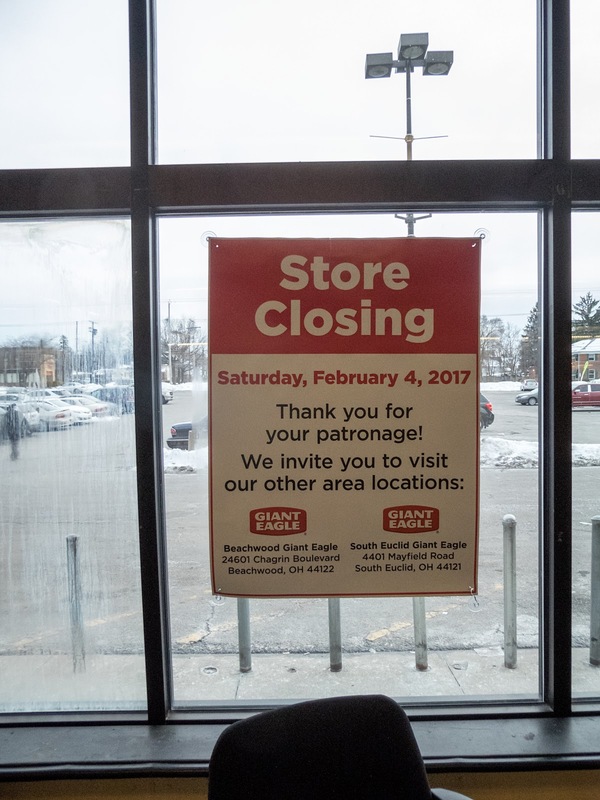 Giant Eagle announced on January 3rd, 2017 that they were shutting down five Ohio supermarkets on February 4th and March 4th. 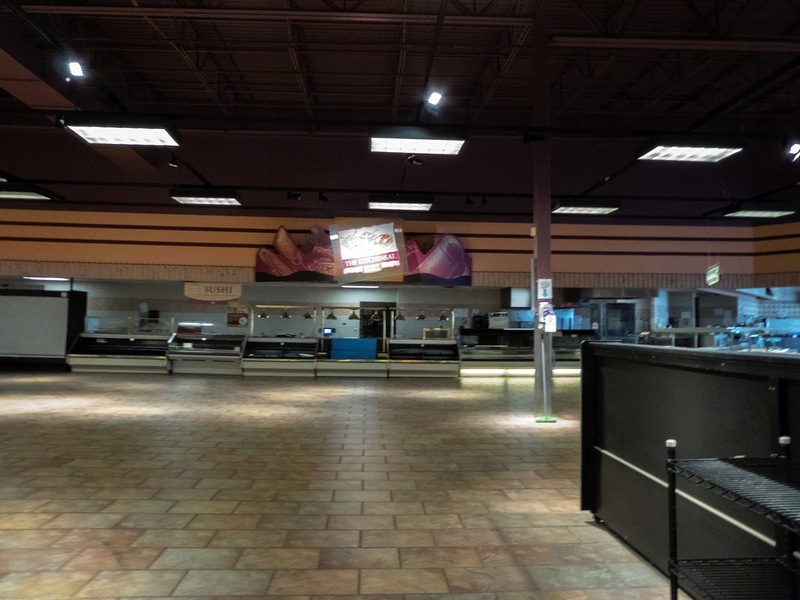 Below is a list of the locations that closed. 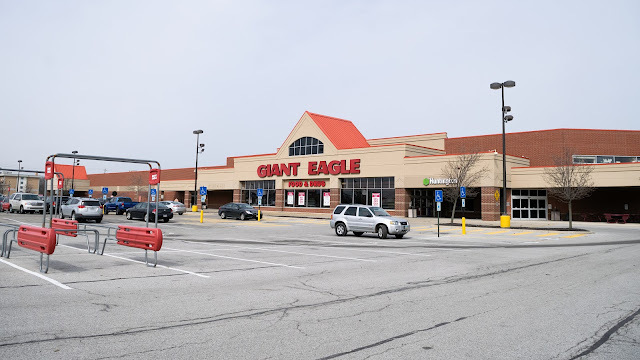 Giant Eagle operates a couple hundred stores under the names Giant Eagle, Giant Eagle Express, Market District, Market District Express, and GetGo in Ohio, Pennsylvania, Maryland, Indiana, and West Virginia The Market District concept stores are generally larger and more upscale than a typical Giant Eagle supermarket. The Giant Eagle Express and Market District Express stores are much smaller; only a few of those exist. 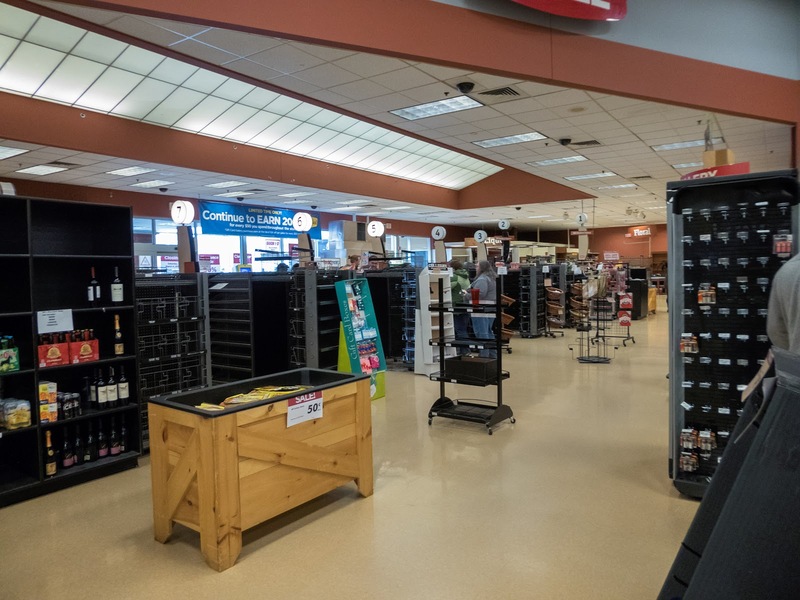 GetGo gas stations range from kiosks in front of Giant Eagle stores to massive convenience stores with dining rooms and kitchens (similar to a Sheetz). 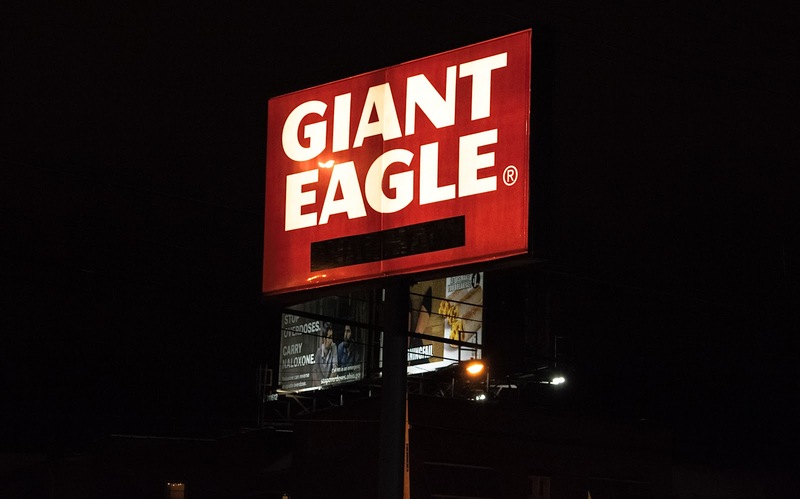 Giant Eagle is based out of Pittsburgh. Their strongest presence is in the Northeastern Ohio and Pittsburgh markets but they also have a smaller presence in Columbus, Erie, Indianapolis, and several medium sized towns. 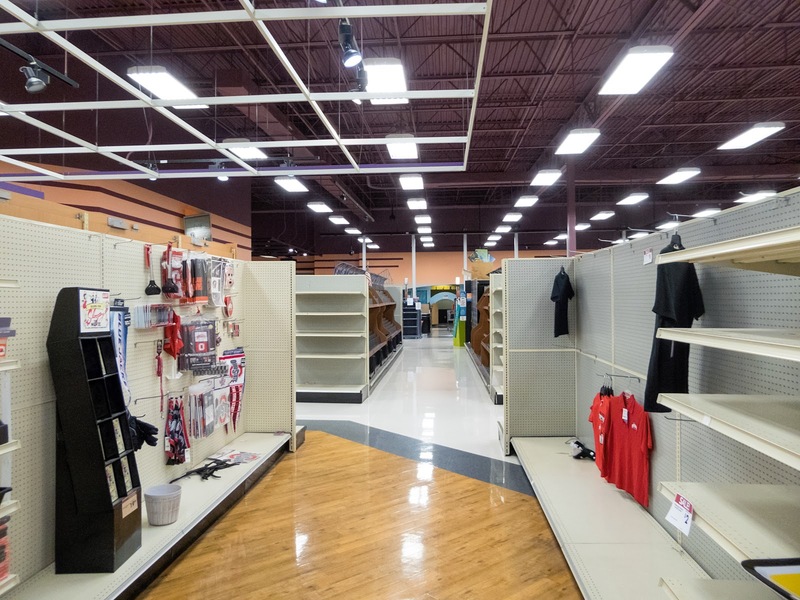 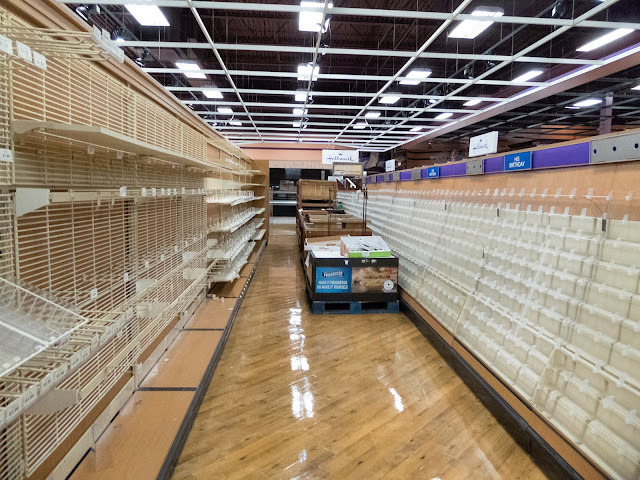 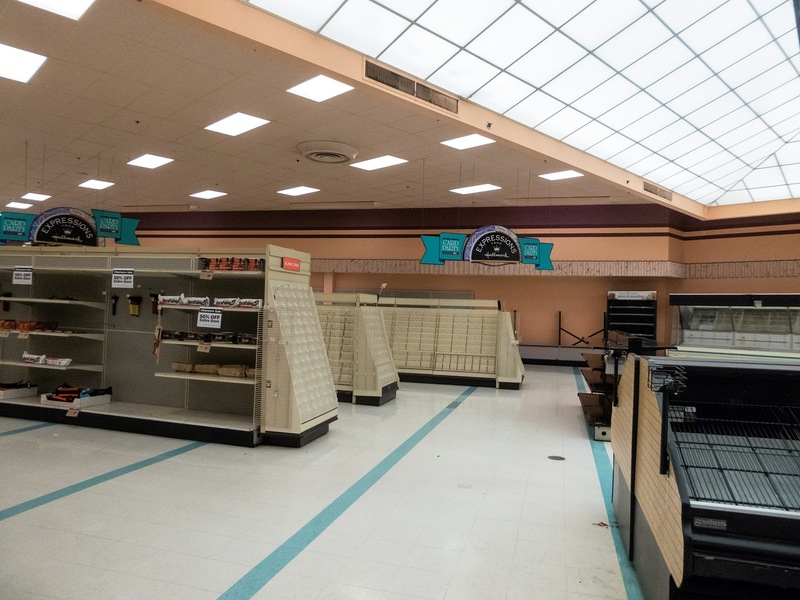 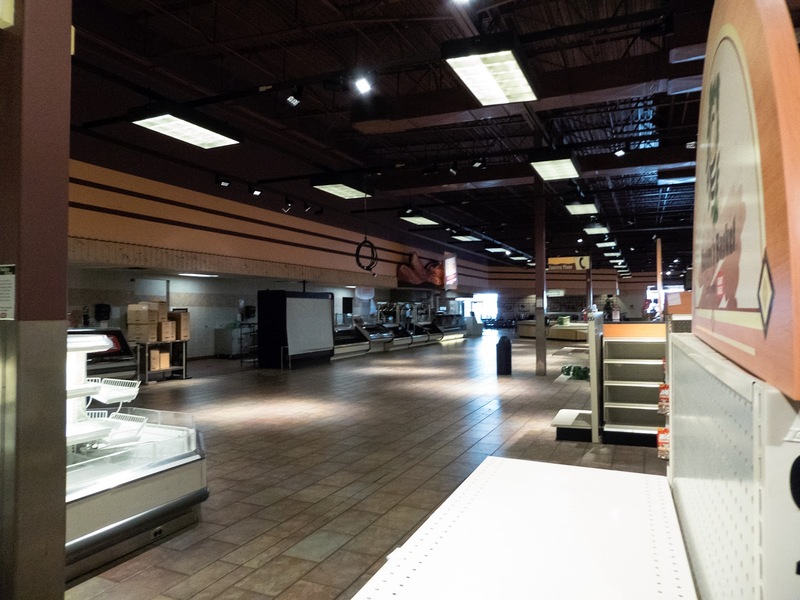 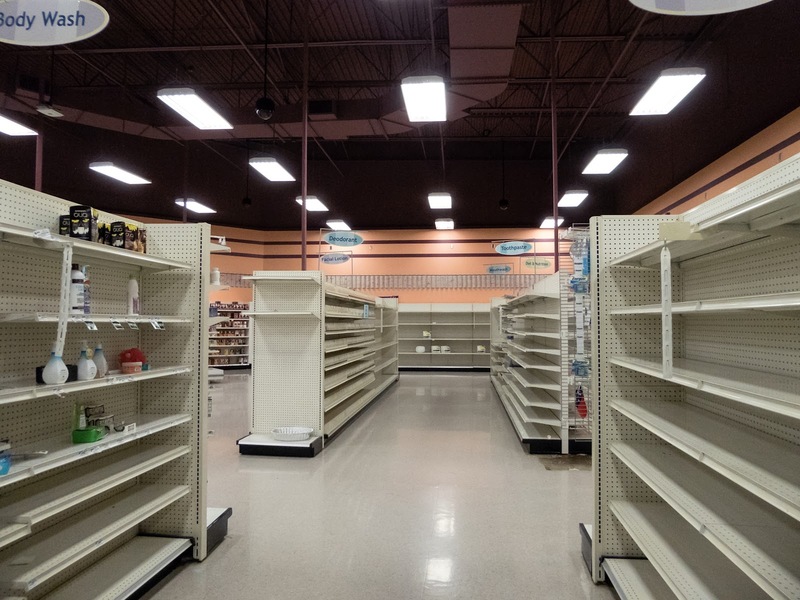 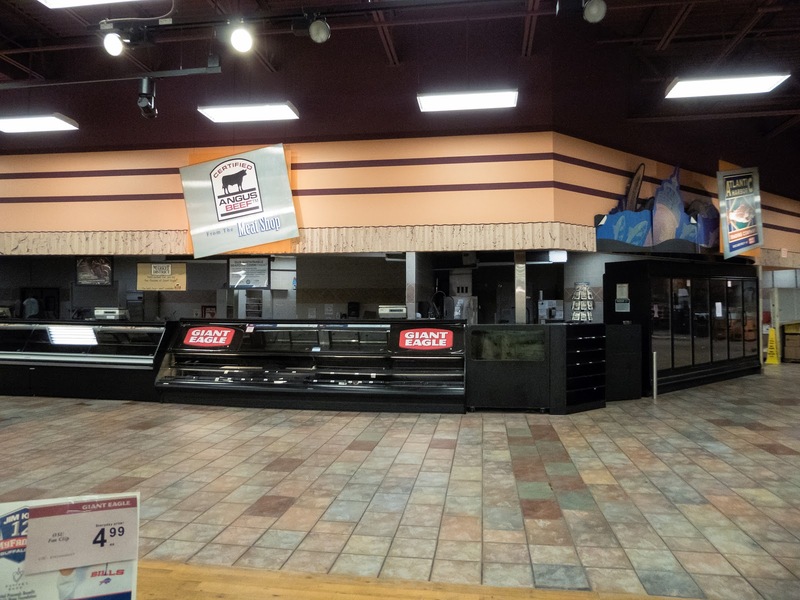 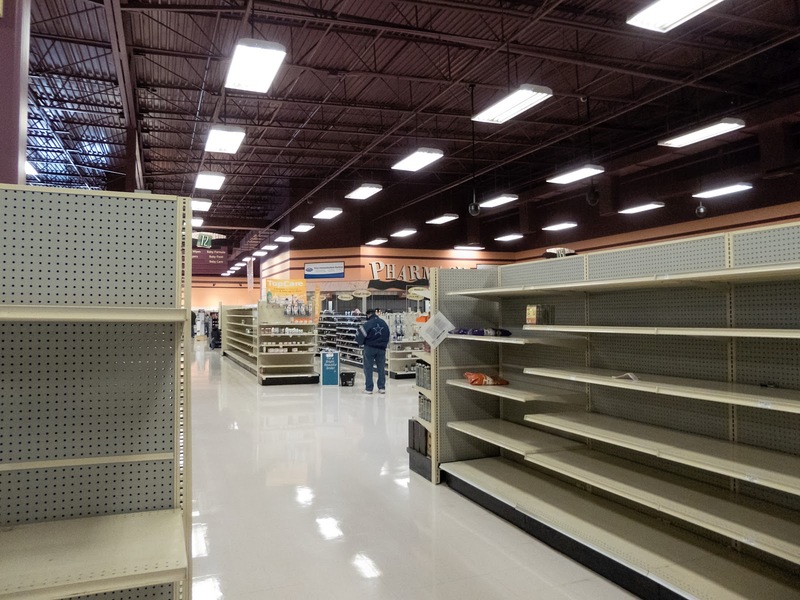 They pulled out of the Toledo market in May 2014 when they closed their two stores there. 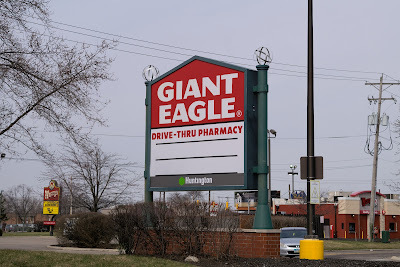 Of course there is more history behind the Giant Eagle chain, but I feel it is only relevant to mention the chains history around Cleveland and Columbus, where the five closing stores are located in this post. Giant Eagle entered into the Cleveland Market after they bought out Riser Foods, an operator of 35 Rini-Rego Stop-n-Shop stores, in 1997. 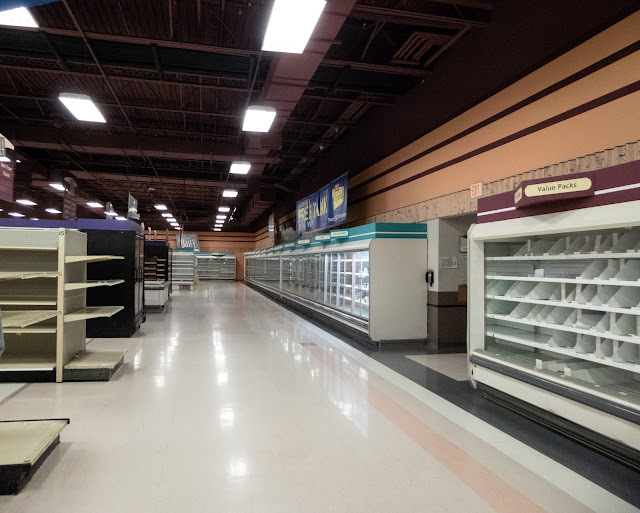 18 other Stop-n-Shop stores were under different franchise names such as Reider's, Vaughn's Country Counter, Russo's, Catalano's, and Gillombardo's. 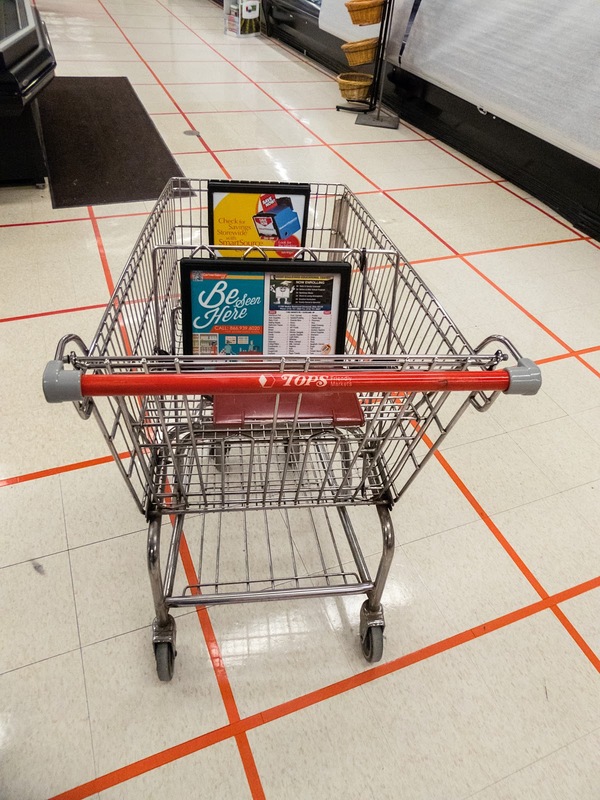 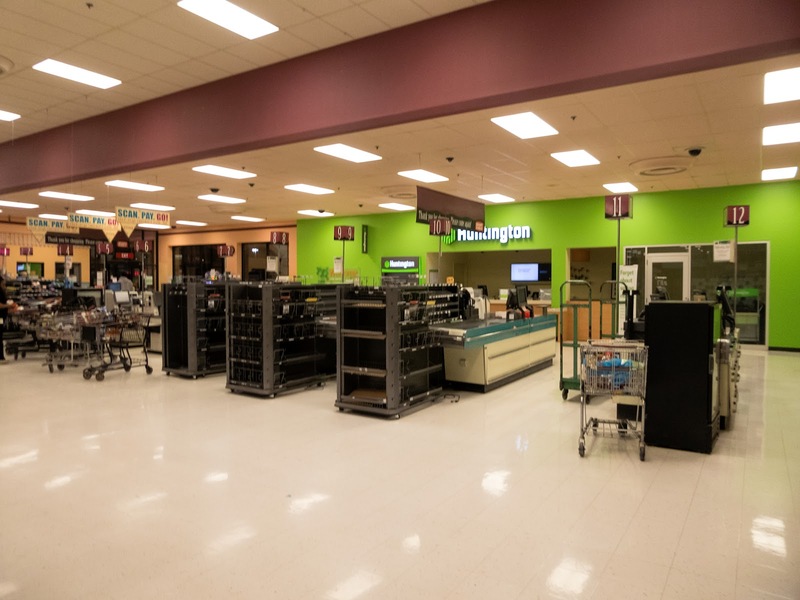 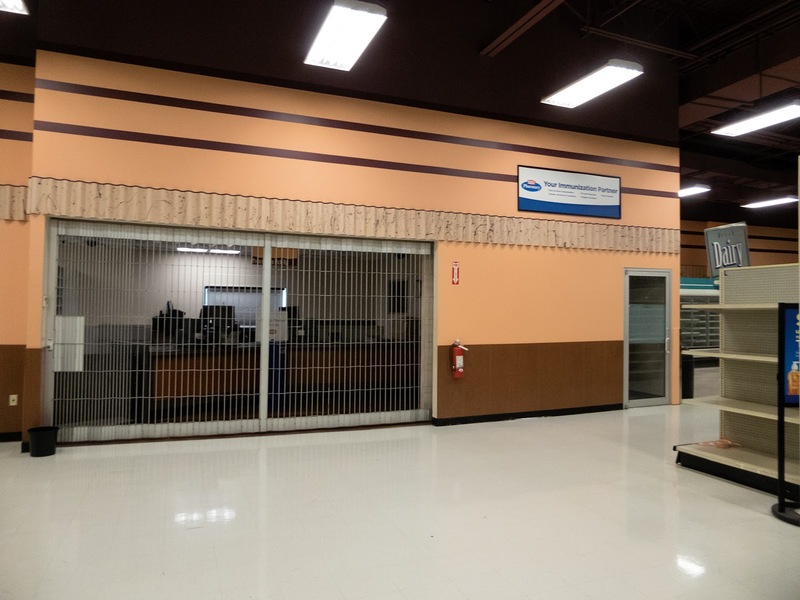 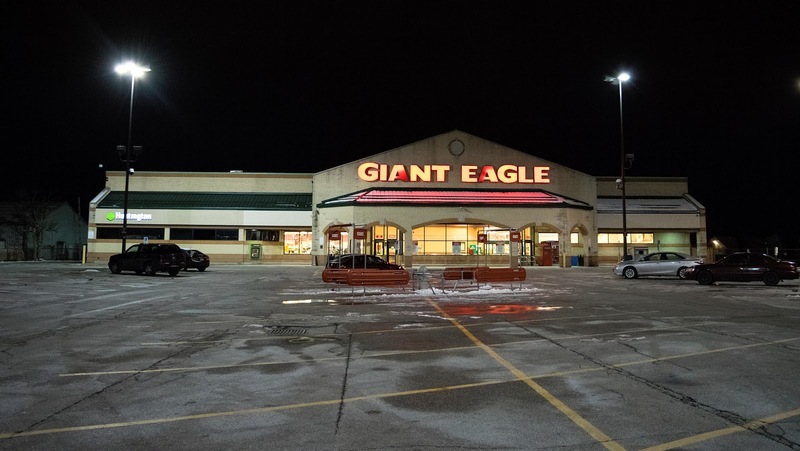 In September 1998, the Rini-Rego Stop-n-Shop stores were re-branded as Giant Eagle and the other Stop-n-Shop franchises became franchised Giant Eagle locations. 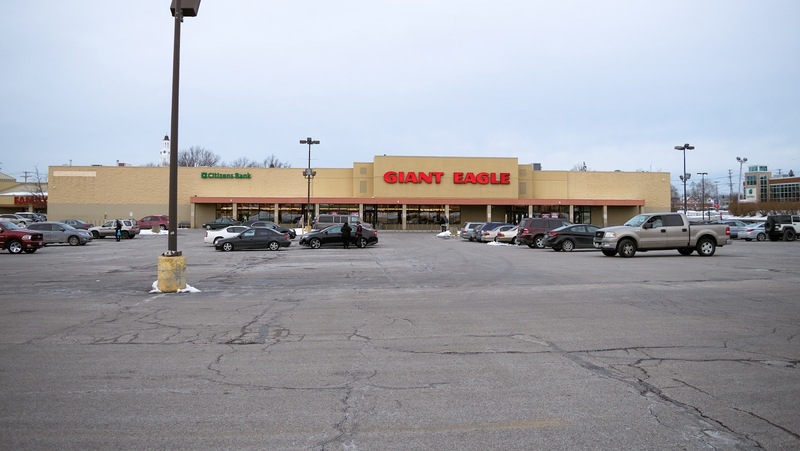 Giant Eagle has since bought out some franchises, but others like Gillombardo's are still around. 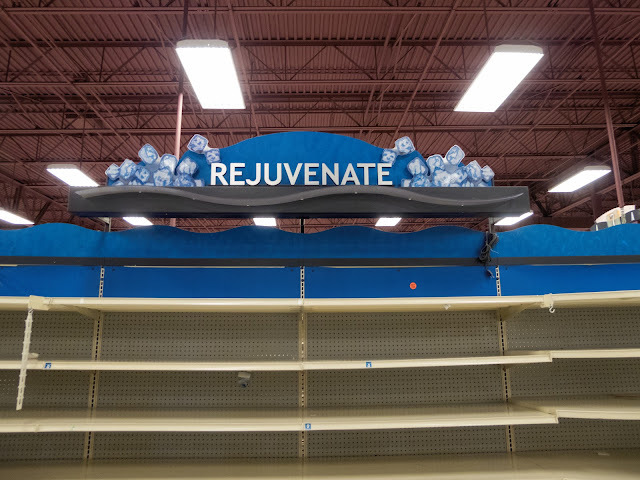 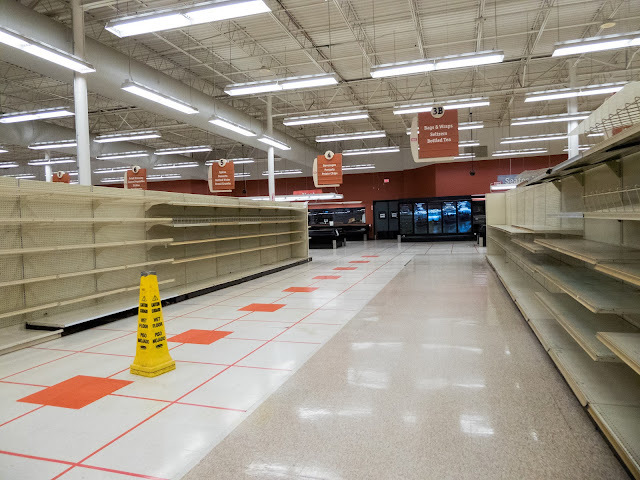 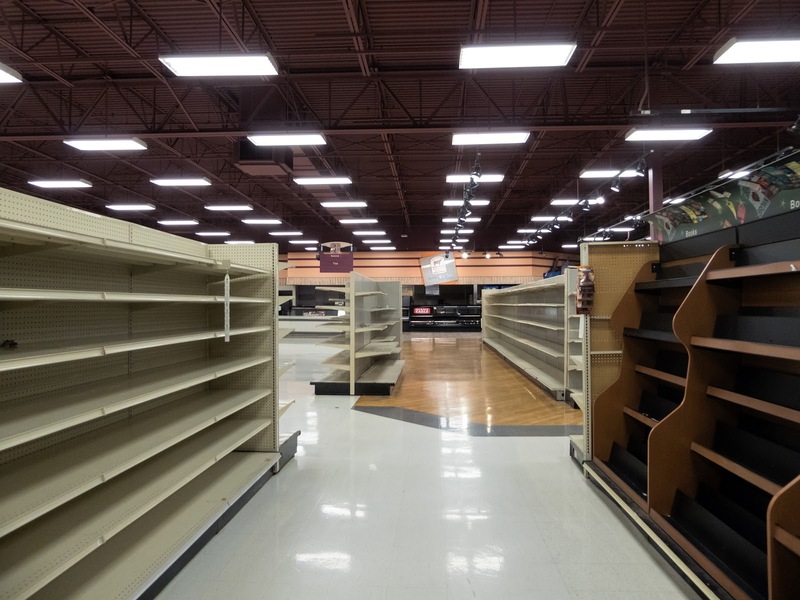 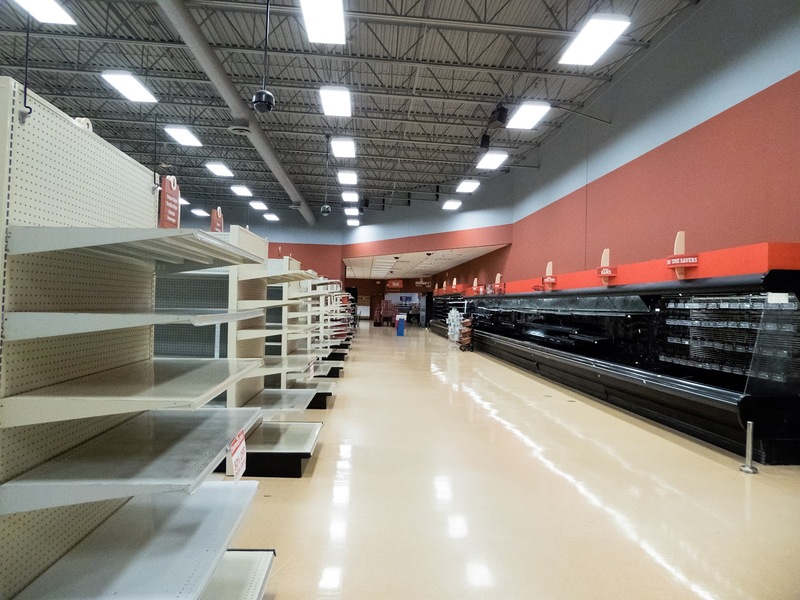 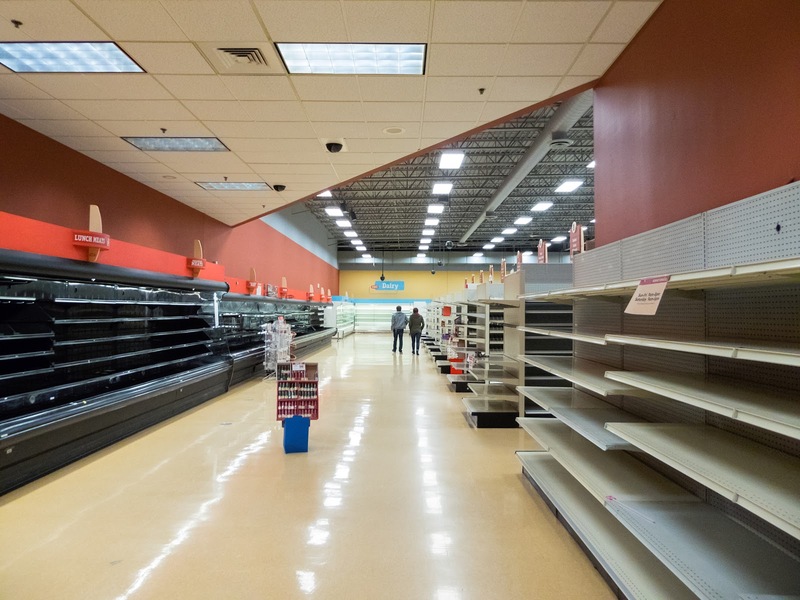 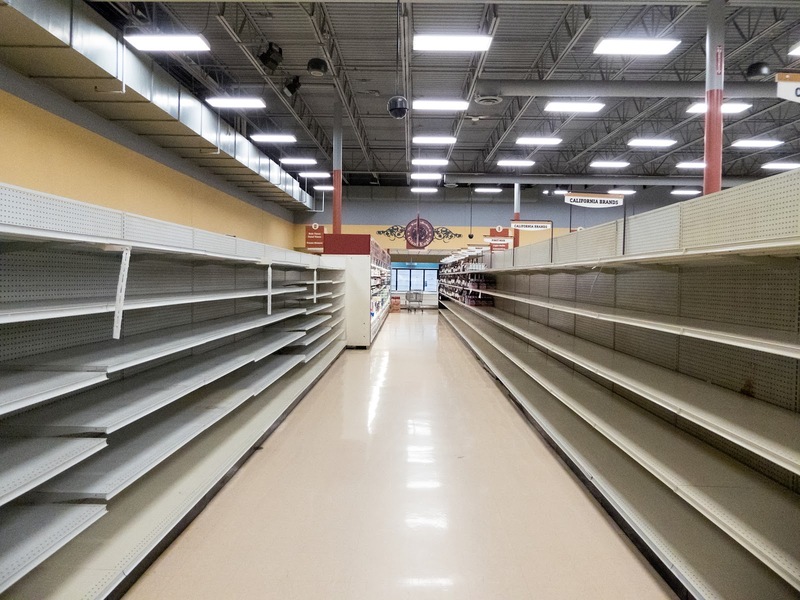 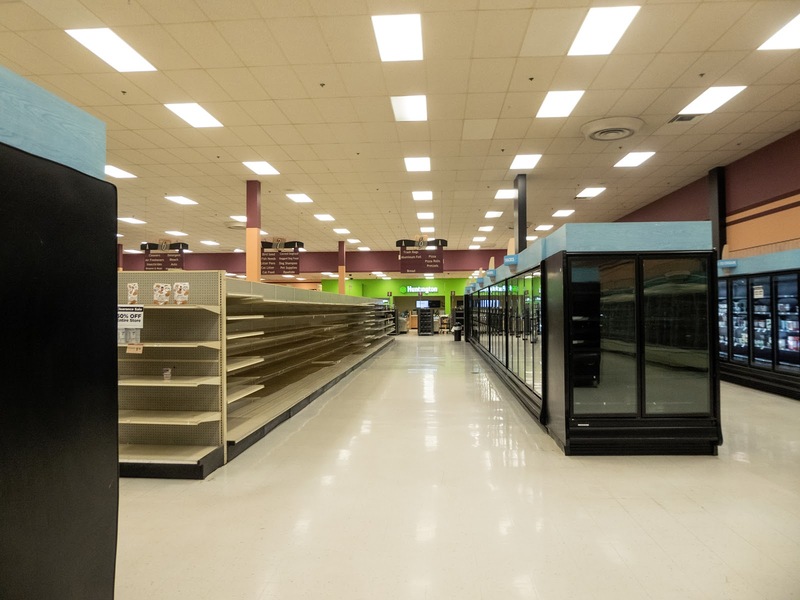 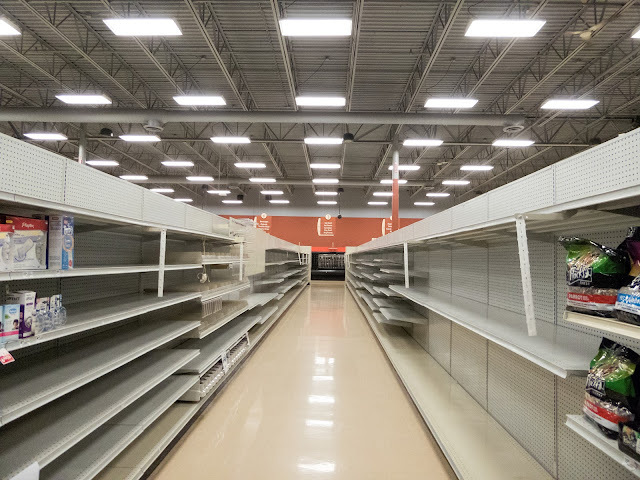 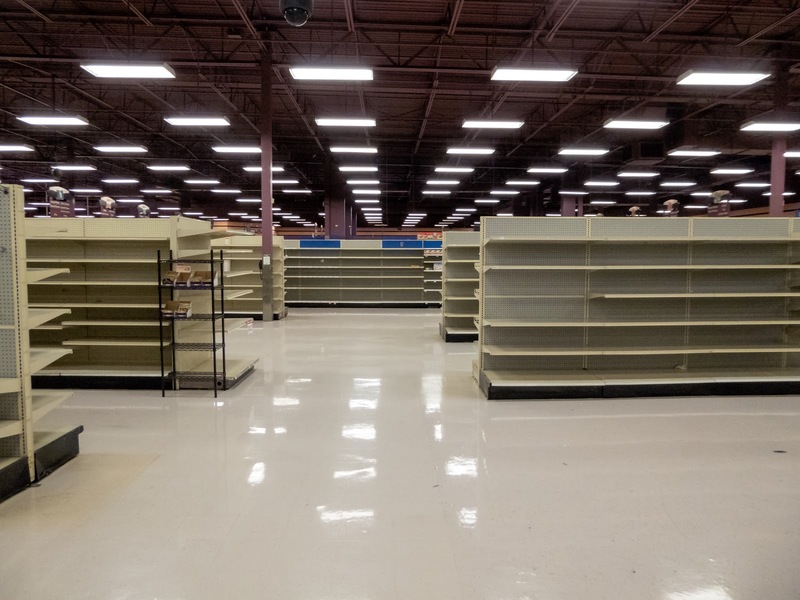 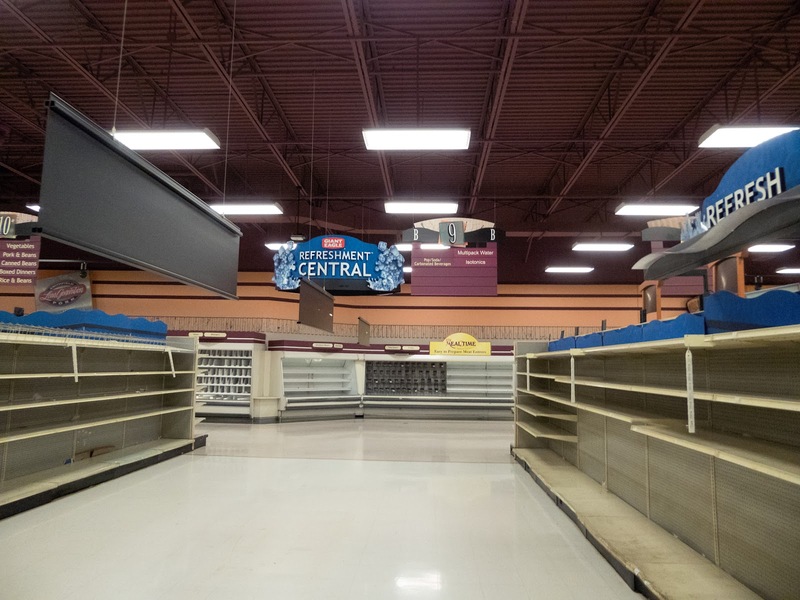 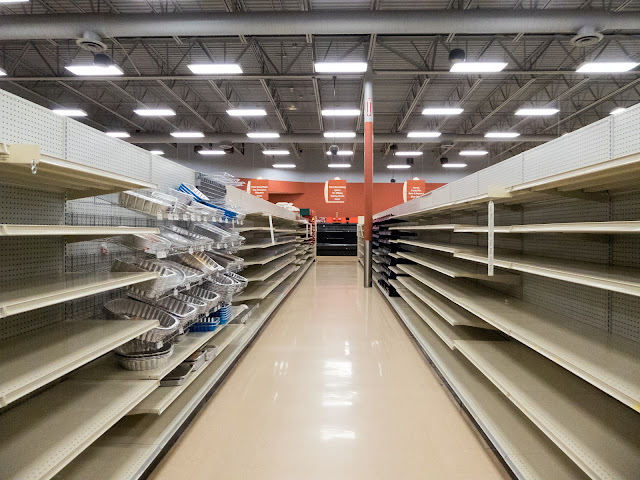 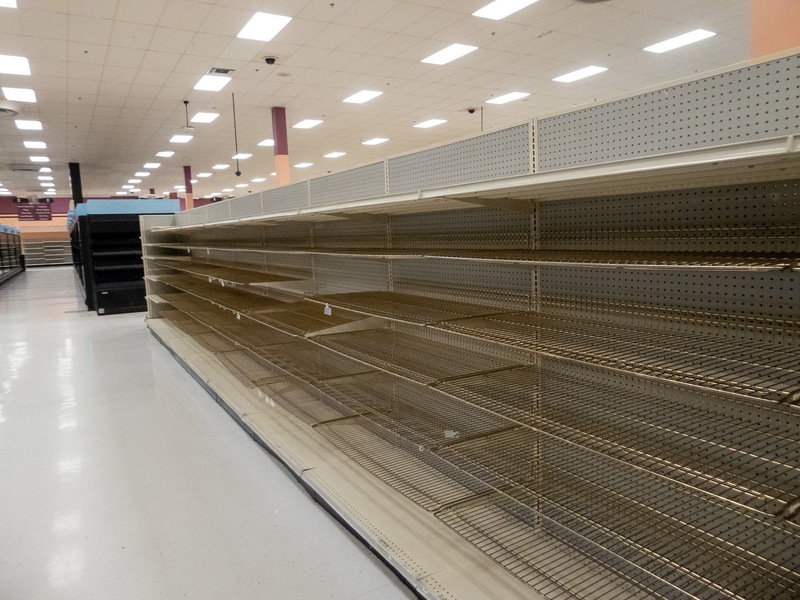 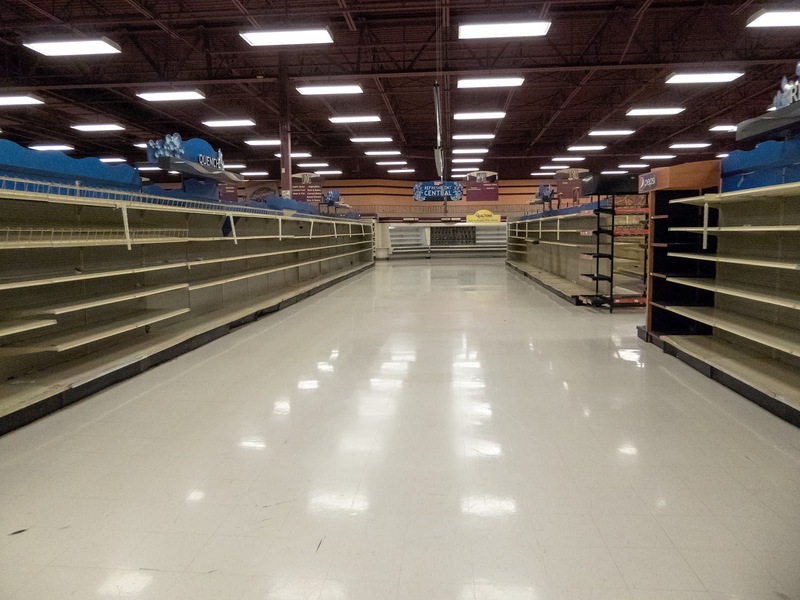 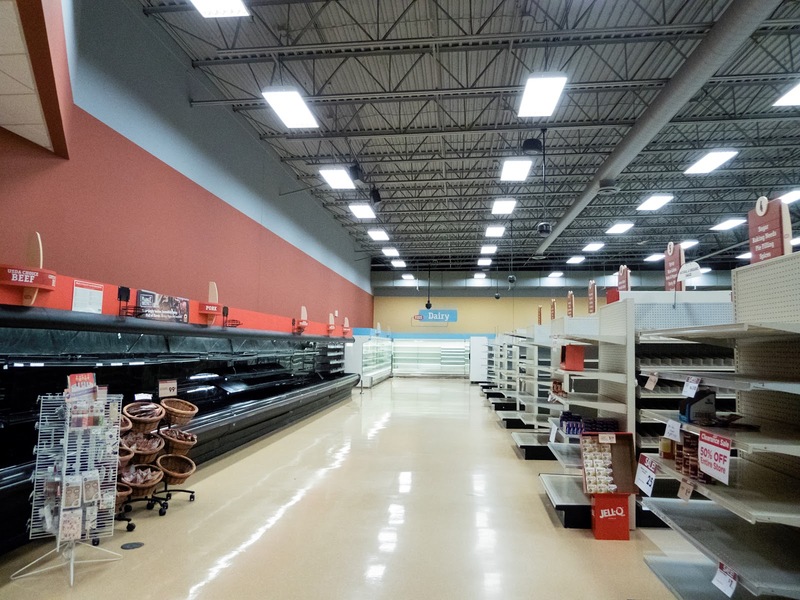 A number of new and replacement stores have also been opened around Cleveland since Giant Eagle's entry into the area. Giant Eagle also converted a bunch of stores from Tops Friendly Market after that chain left Ohio in December 2006. The Buckeye Road store in this post was a Tops takeover store and the Lorain Avenue location was a Rini-Rego Stop-n-Shop conversion. I feel that the two Cleveland locations closed mostly due to lower incomes and other Giant Eagle or affiliated stores nearby. Giant Eagle entered the Columbus area with two stores in November 2000 on Dublin-Granville Road in Columbus and North Main Street in Lewis Center. 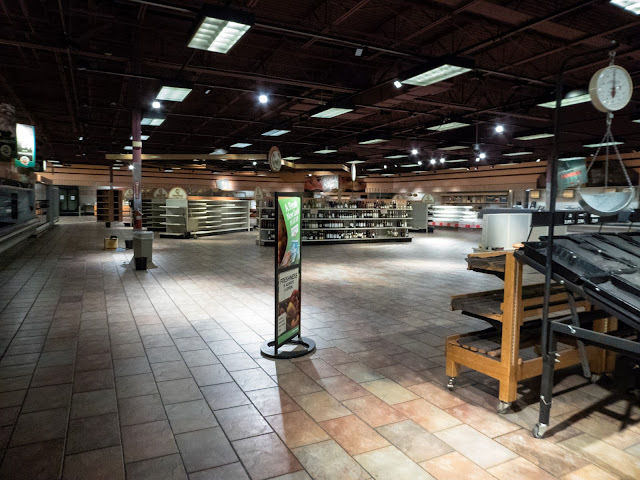 Those first two stores were massive at over 110,000 square feet. 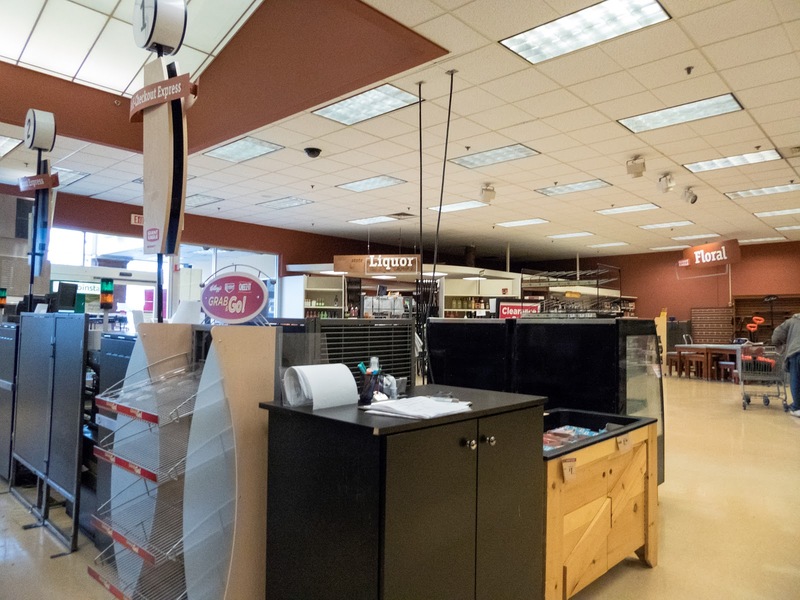 Dublin-Granville Road is one of the closing stores covered in this post and its sister store in Lewis Center has since been downsized with space being leased out to Staples. Giant Eagle later built more typical toned down stores in the 70,000 and 80,000 square feet ranges. 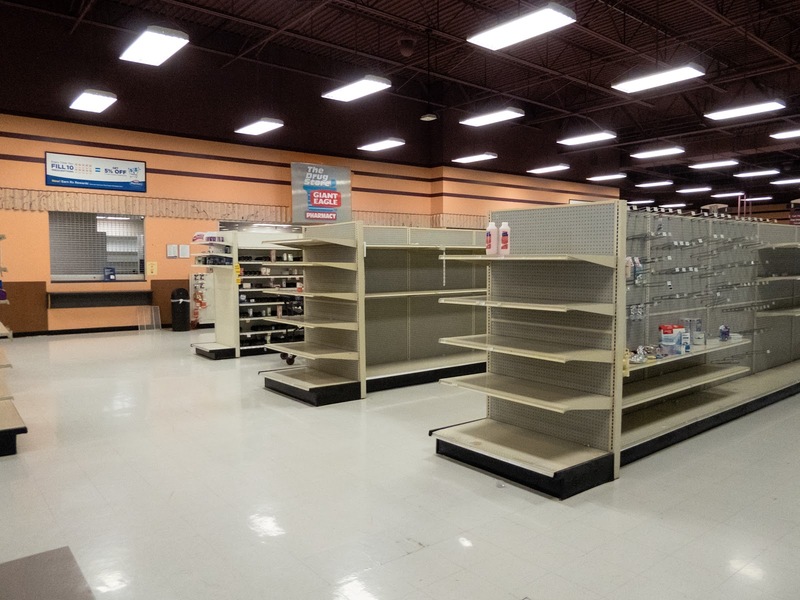 Hilliard, another closing store, was one of these. 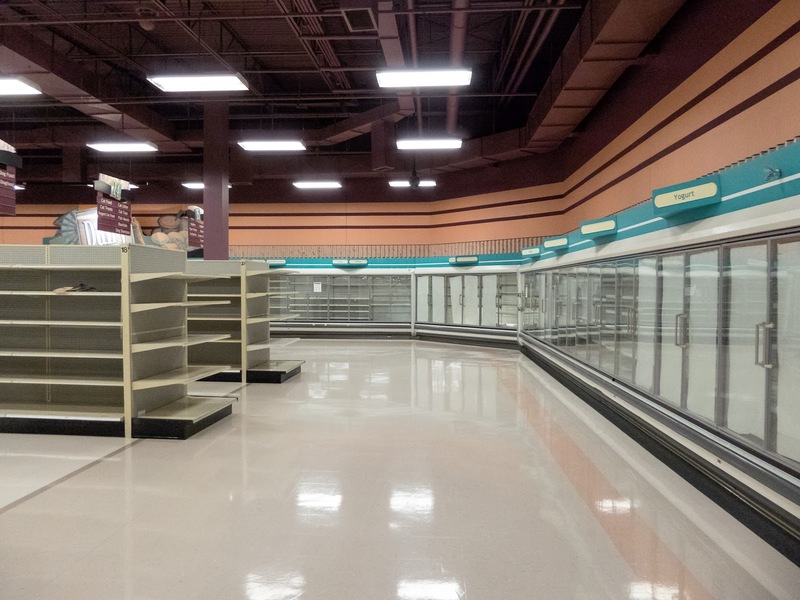 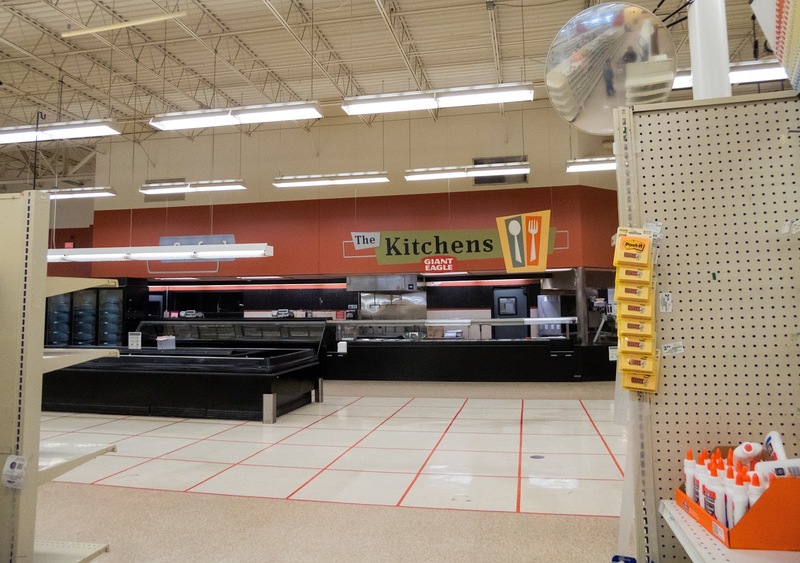 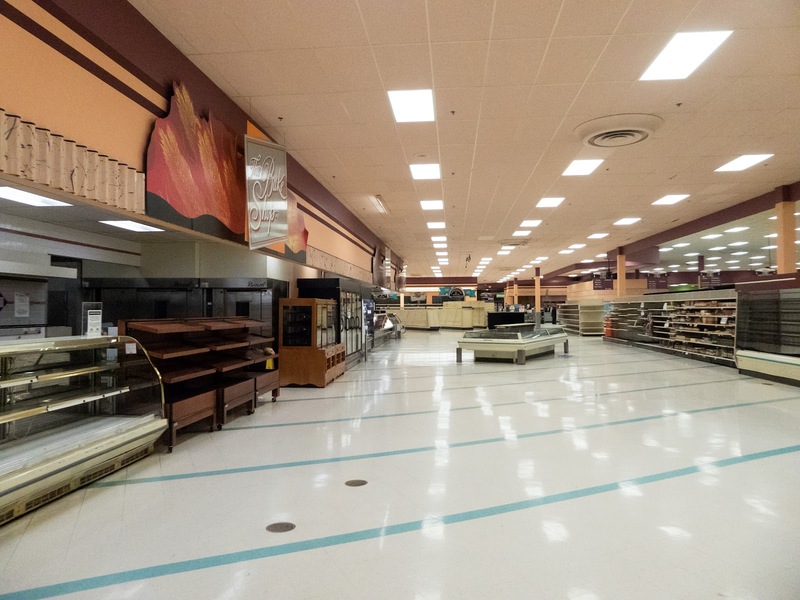 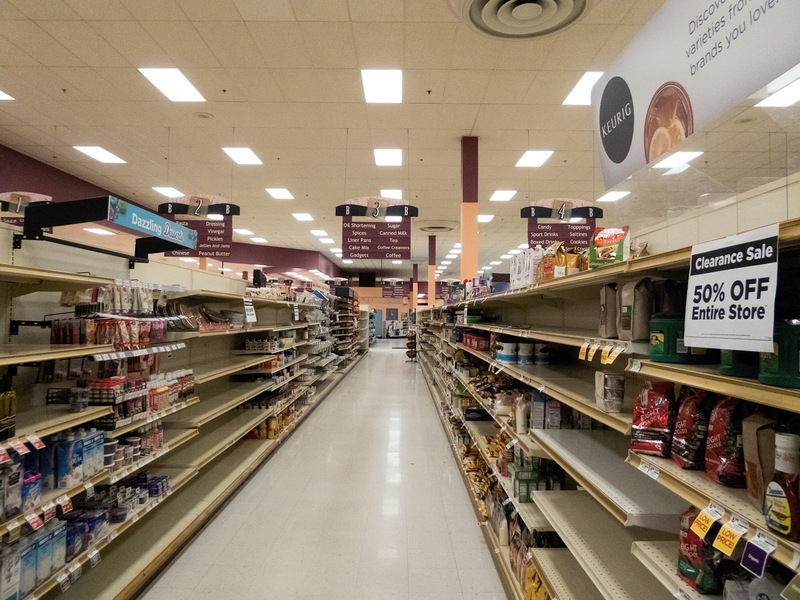 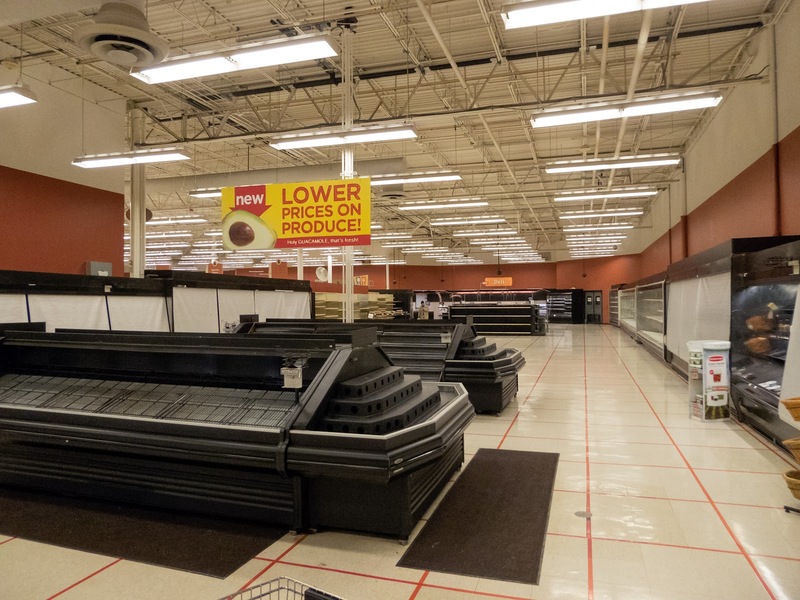 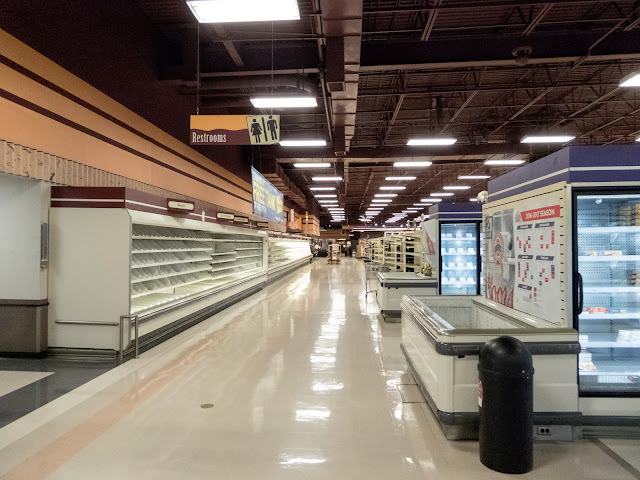 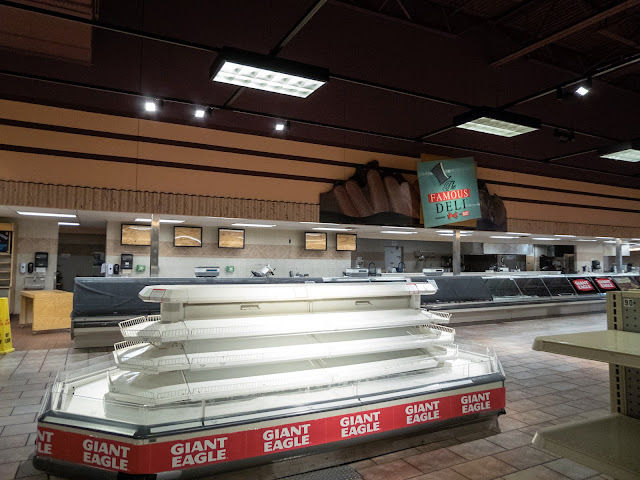 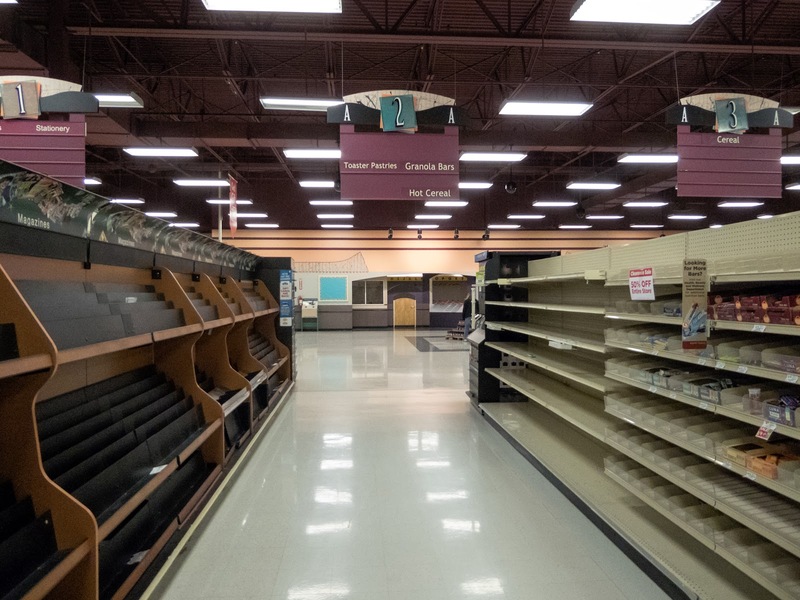 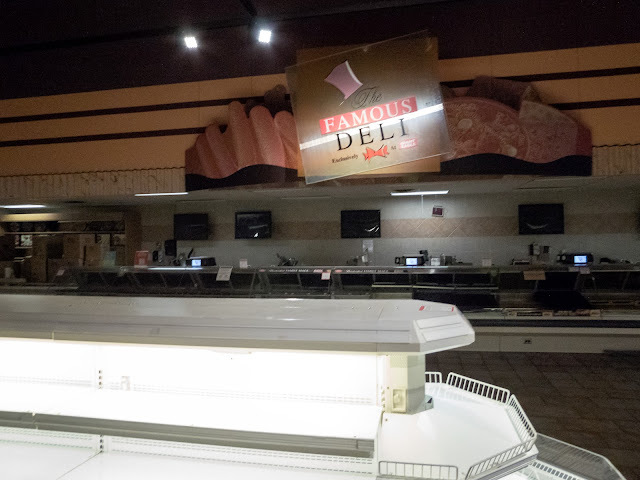 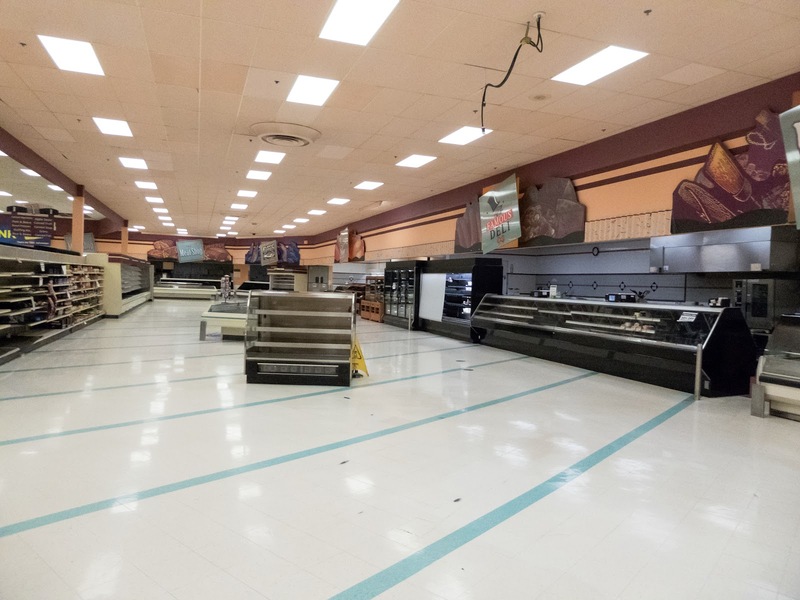 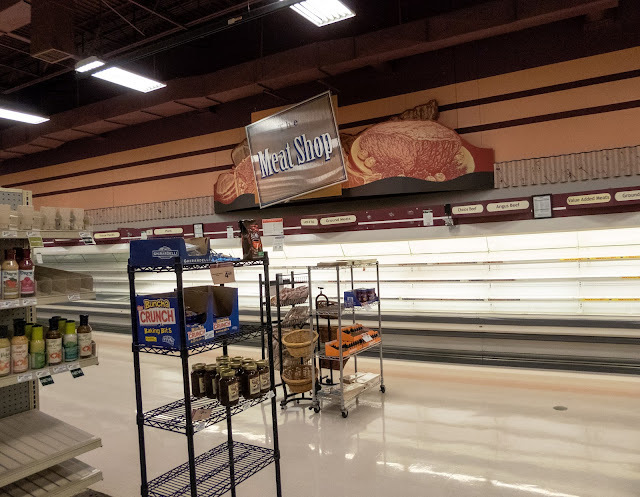 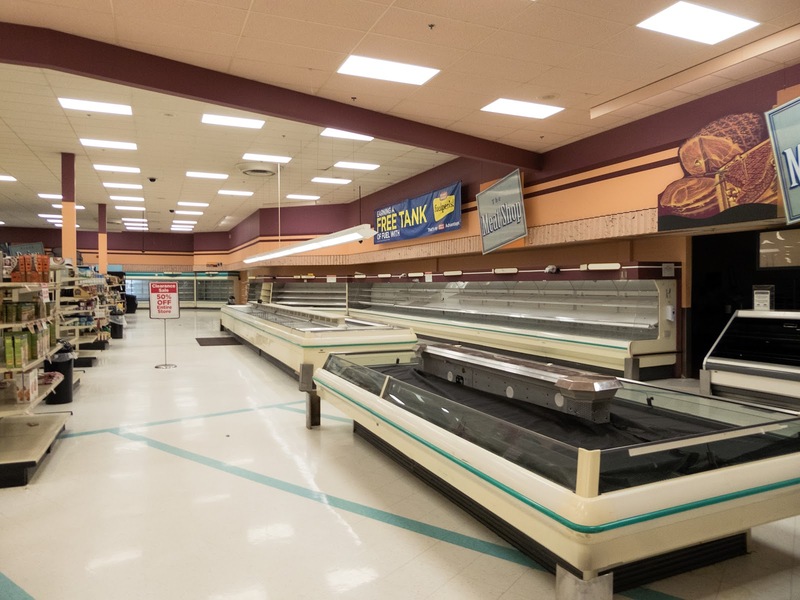 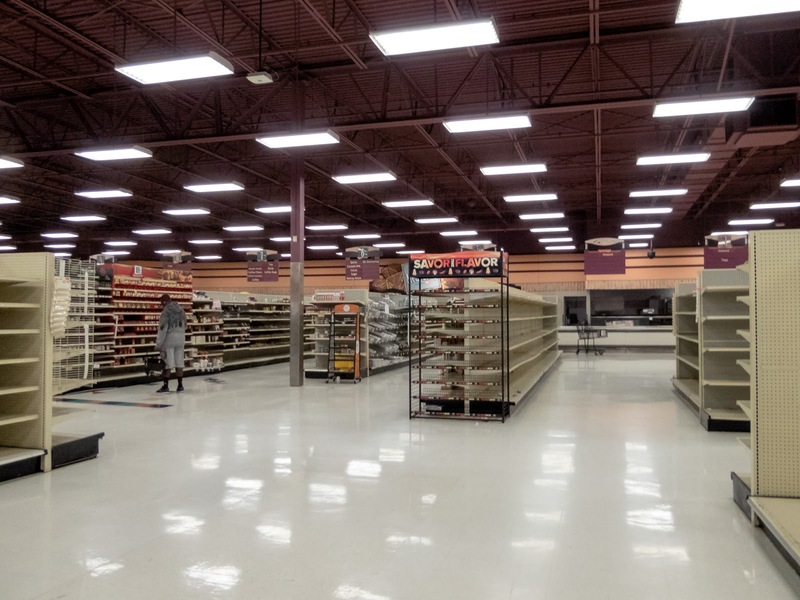 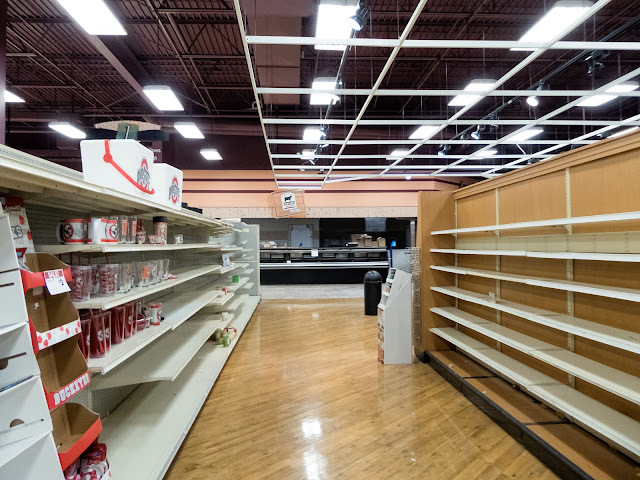 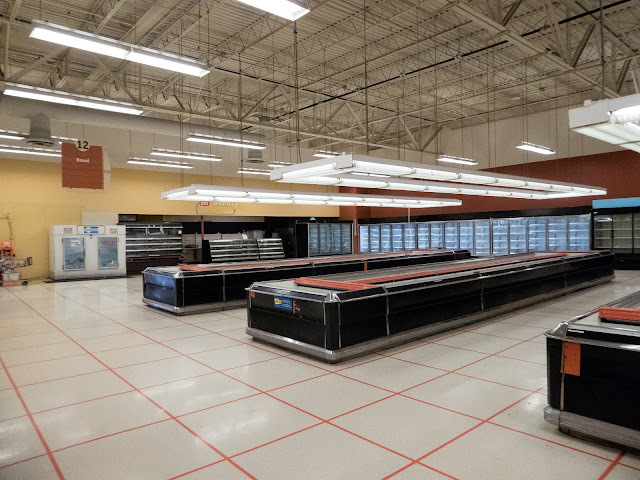 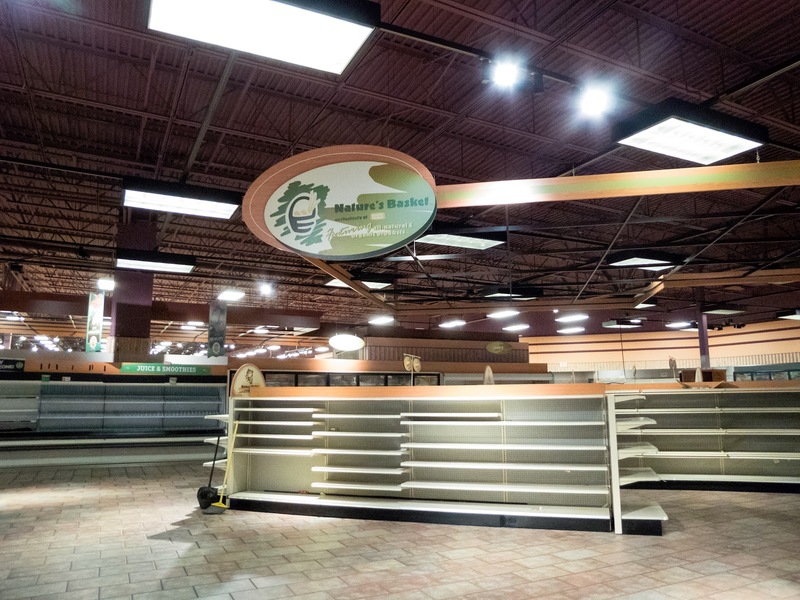 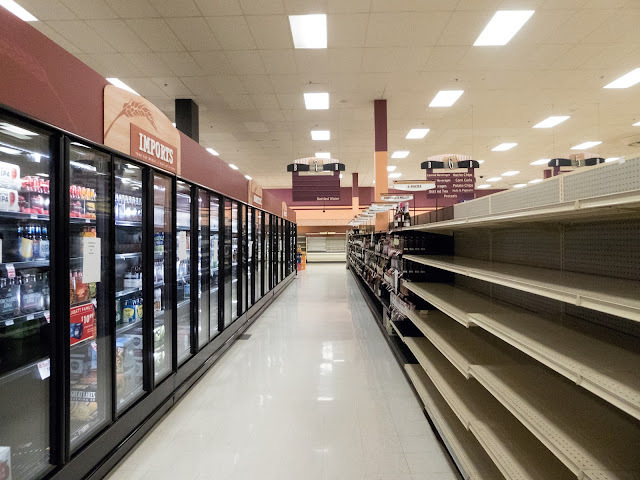 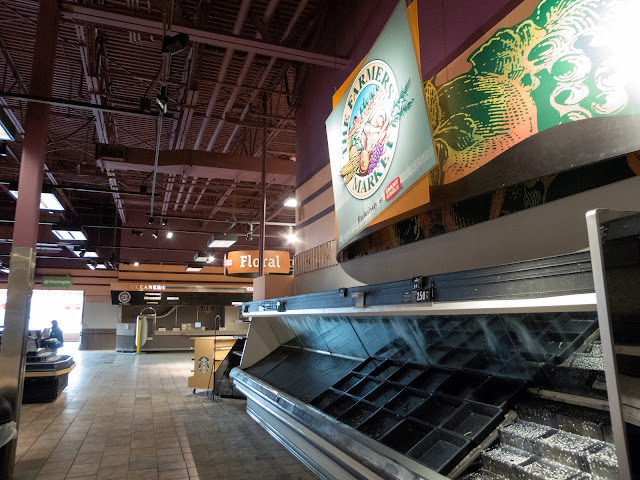 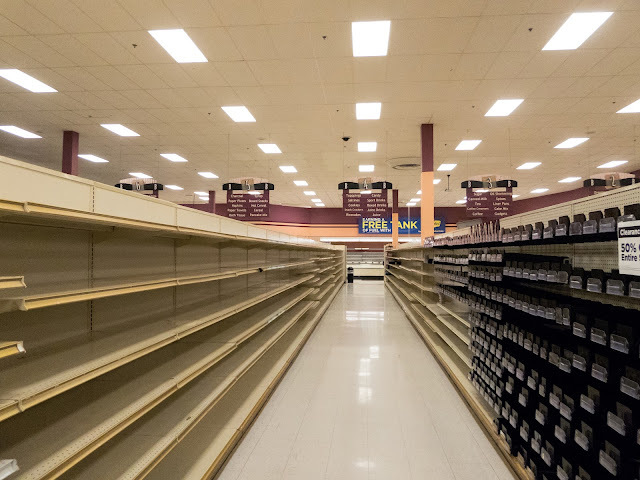 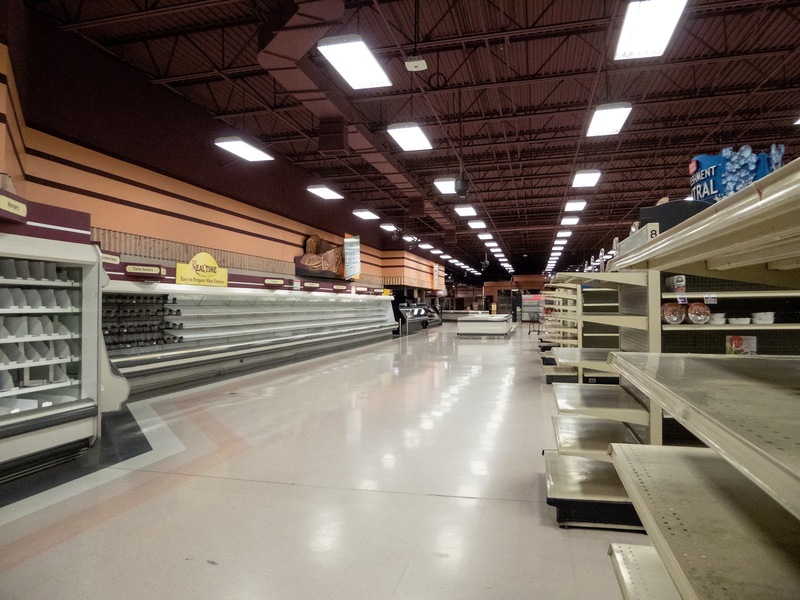 In February 2004, Giant Eagle took over eight Big Bear supermarket stores after that chain liquidated all of their stores. The Neil Avenue store in this post was one of those locations. 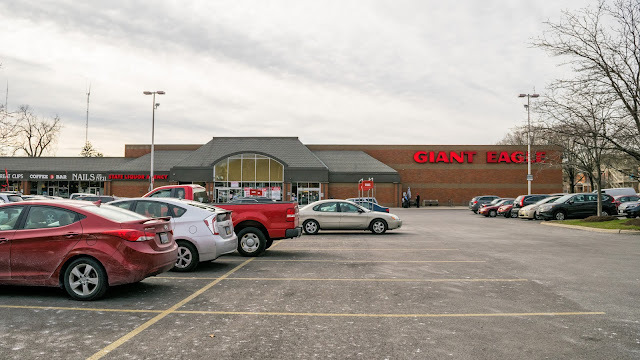 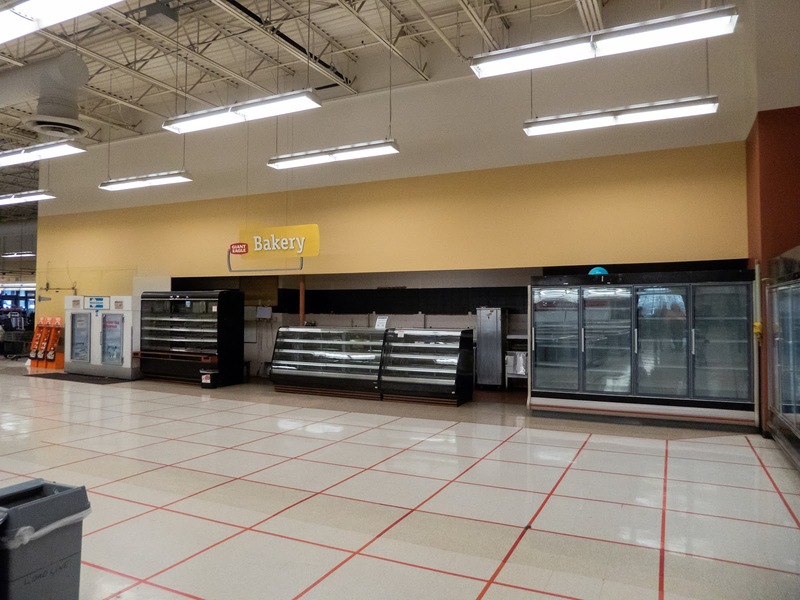 Since then, several new Giant Eagle stores have opened including another Hilliard location (2014) and a Market District in Grandview Yard (2014). 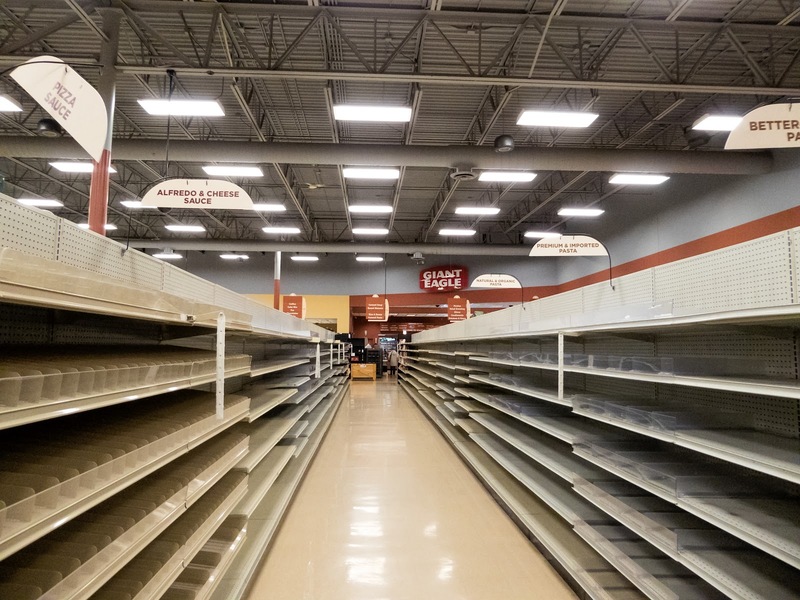 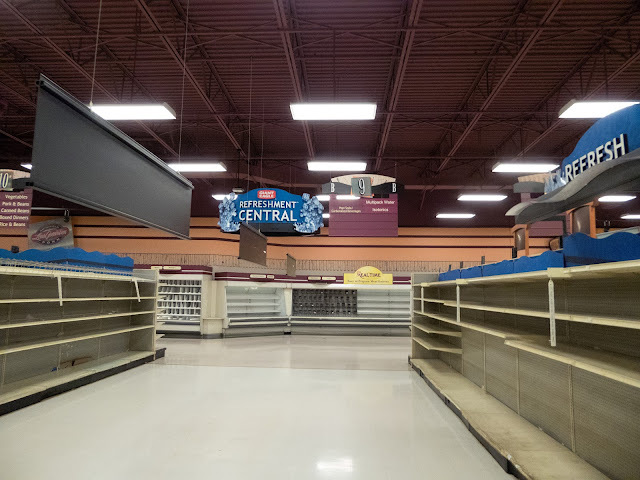 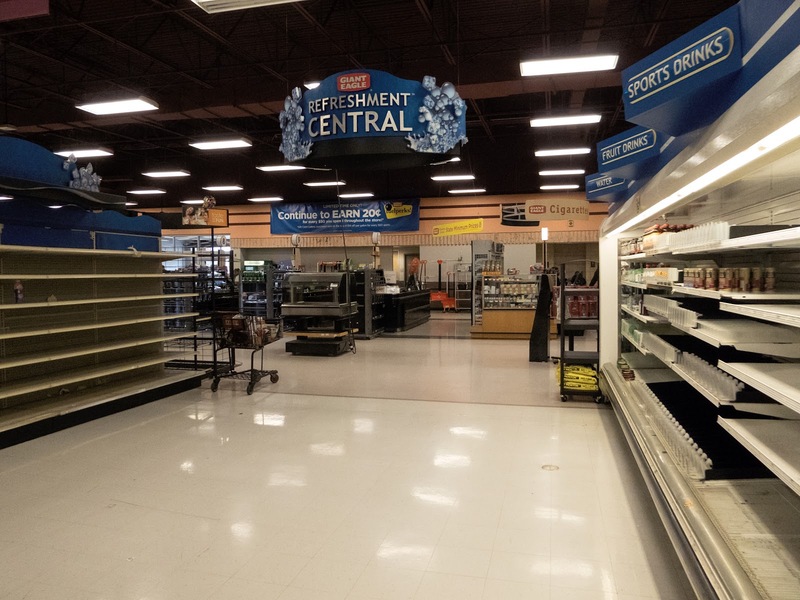 I feel those two newer stores, in particular, and intense grocery competition in the Columbus Area have contributed to the three Columbus store closings. 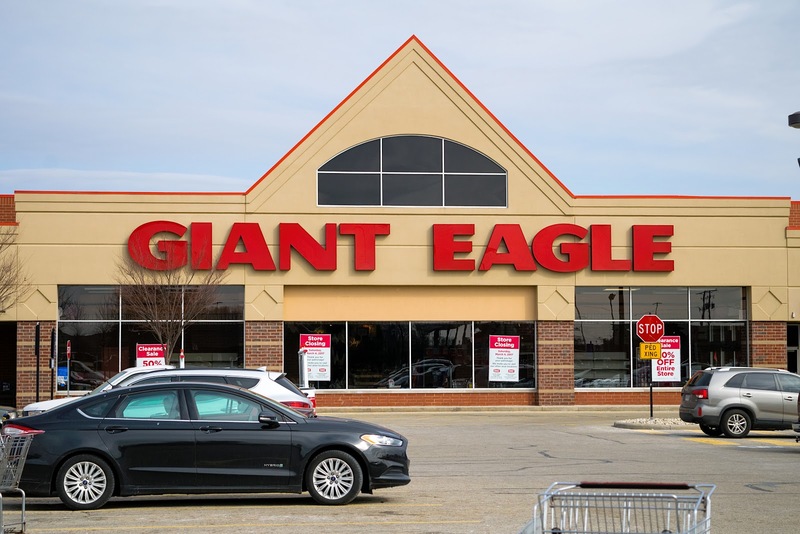 Based on new reports, it appears that employees from all the closing stores were able to get positions at other Giant Eagle stores. 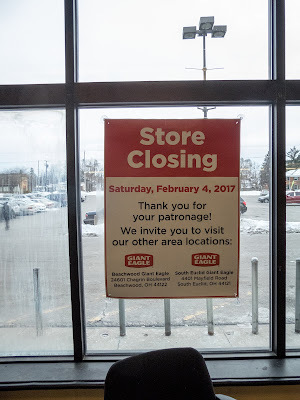 These closings still might hurt the local communities they were in, but I doubt some of these locations will be empty long. 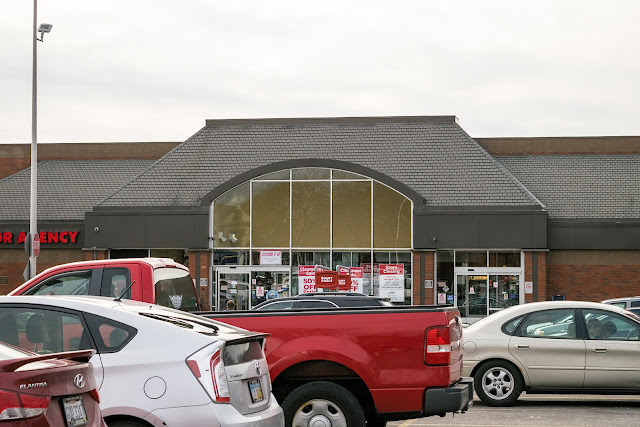 Out of all five stores, I worry most about the Buckeye Road store in Cleveland not finding a new use. 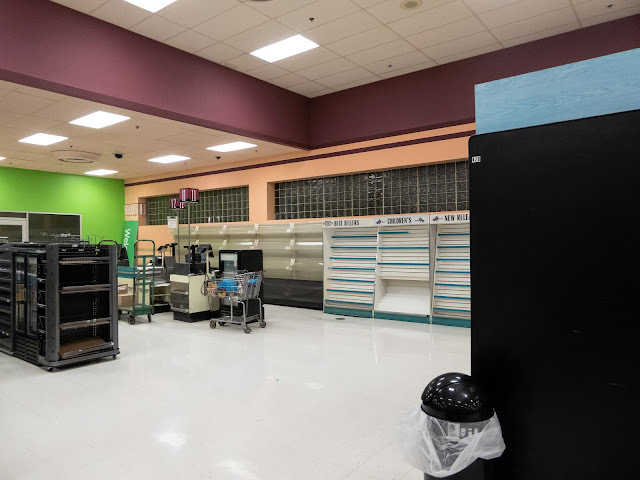 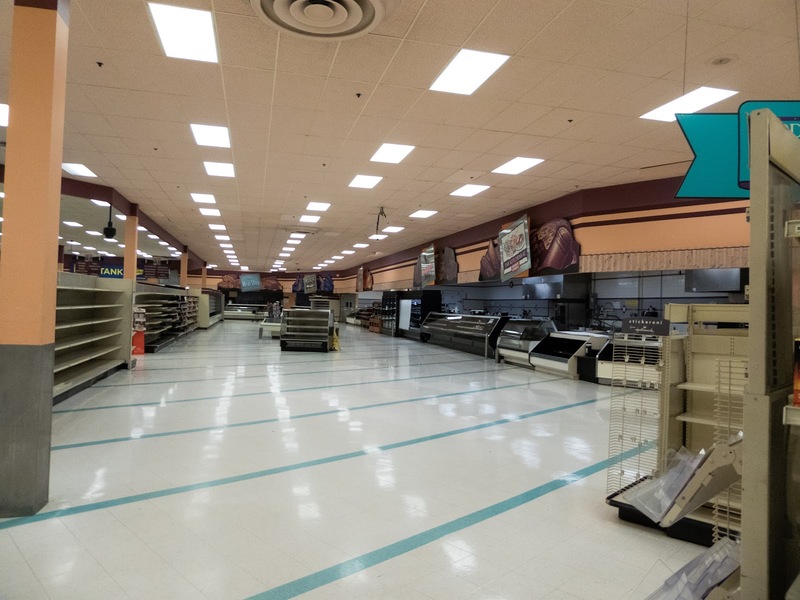 These pictures were taken on each store's final day in operation, with the exception of the Lorain Avenue store in Cleveland (taken a day before closing). 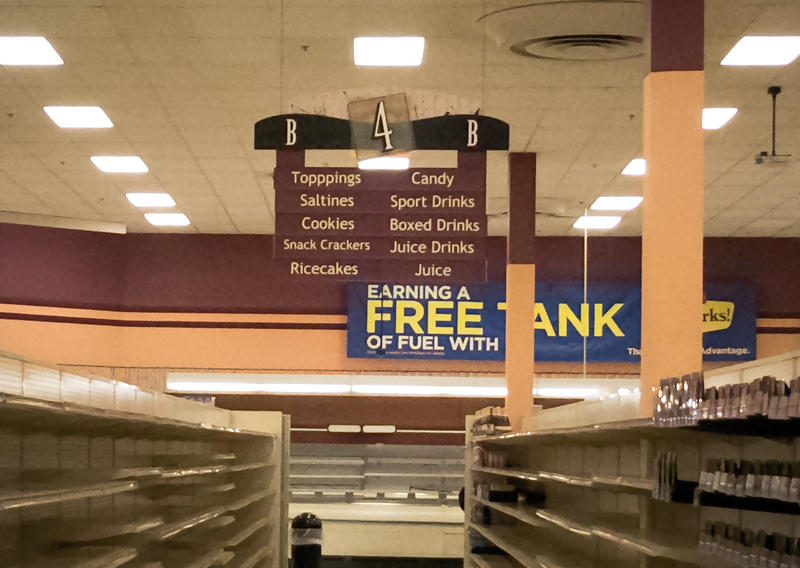 The area around this store appeared to be suffering quite a bit economically. 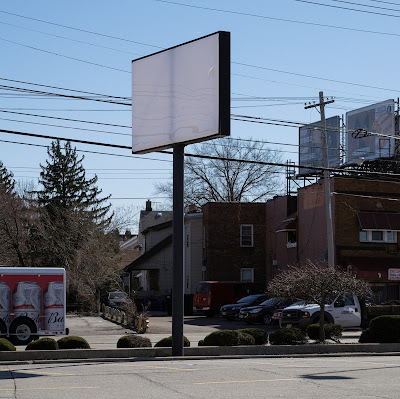 According to city-data.com the median household income in this neighborhood is $16,389 a year. 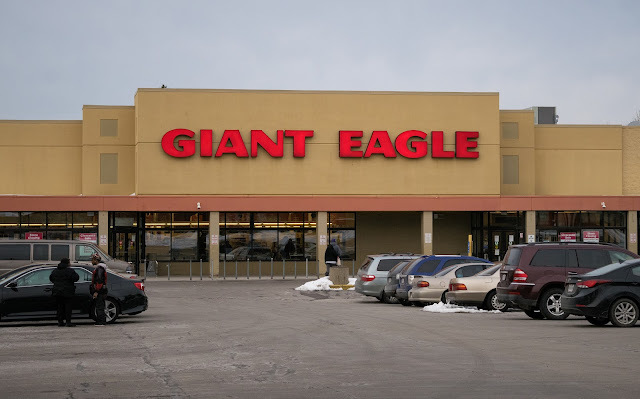 I imagine another factor in this store's closing was that there is a Giant Eagle supplied and independently ran Dave's Market location less than a mile away by Shaker Square. 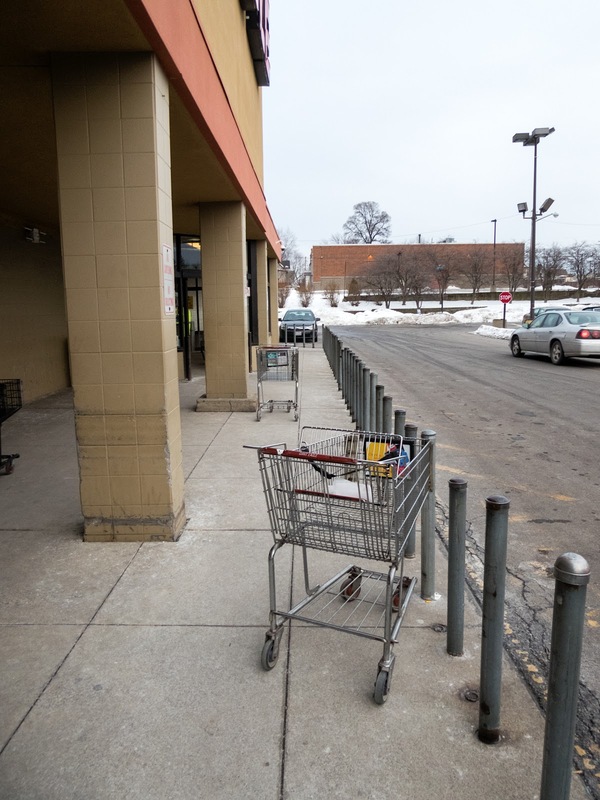 One thing that did seem weird is how carts were blocked from going into the parking lot by poles. I don't know if that was some crazy rule by the landlord or if they had a problem with carts being walked off with. The poles didn't look that new and might have dated back to the Finast / Tops days. 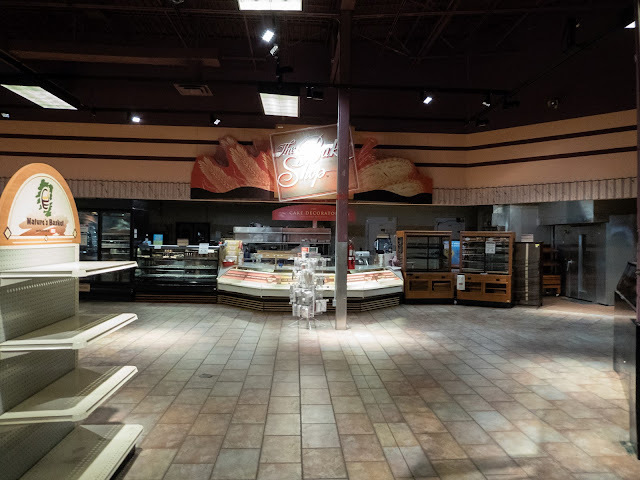 The inside of the store was set up and used the same equipment as Finast / Tops. 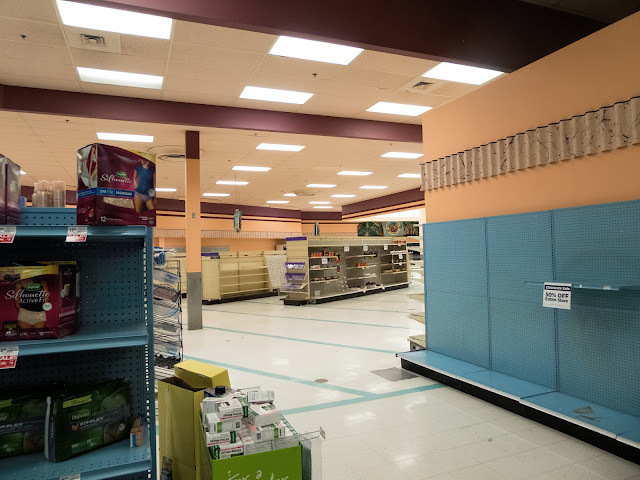 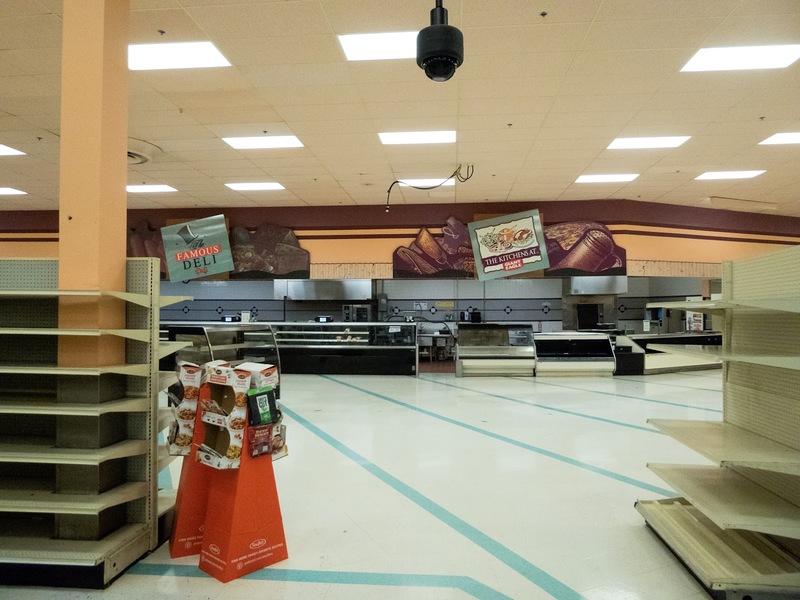 The open ceiling was still painted beige, like a Finast / Tops, rather than a dark brown like typical Giant Eagle stores are. 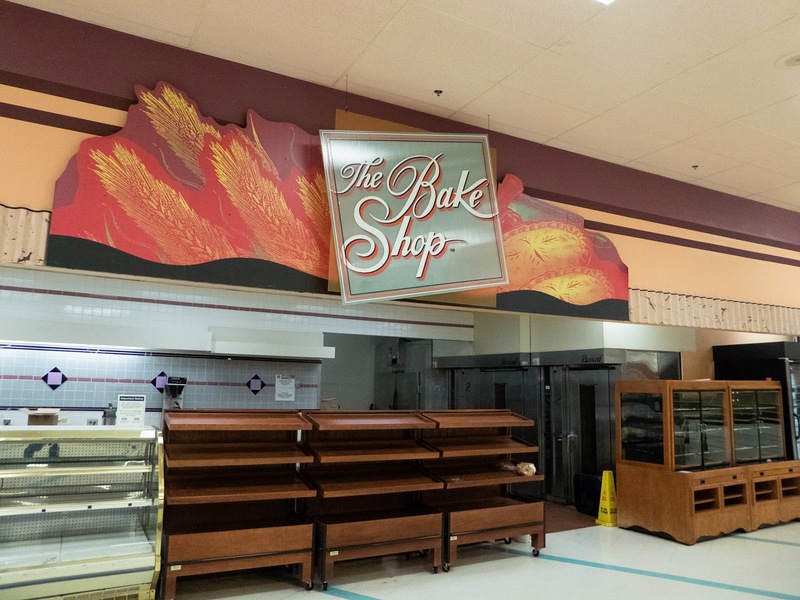 The walls were repainted and the signs were replaced by Giant Eagle. The sign package appears to be the one dating to the mid to late 2000s, around the time Giant Eagle took over Tops stores in the area. 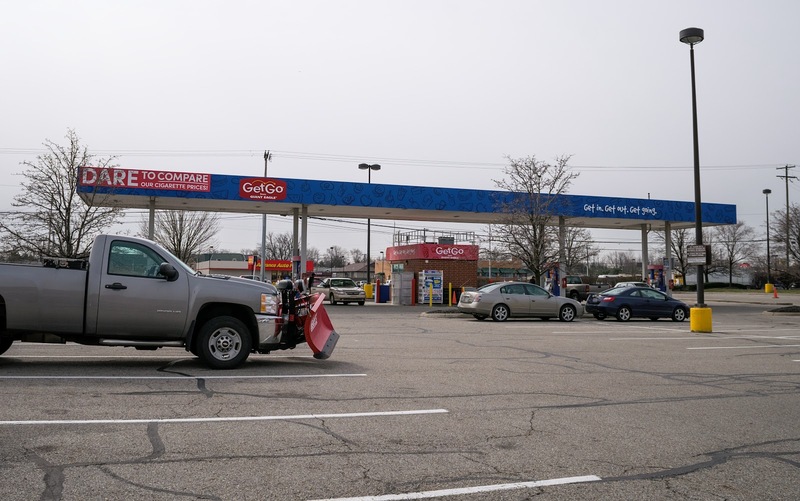 Carts couldn't go into the parking lot, but there was still space to pull-up cars and load them at the front of the store. 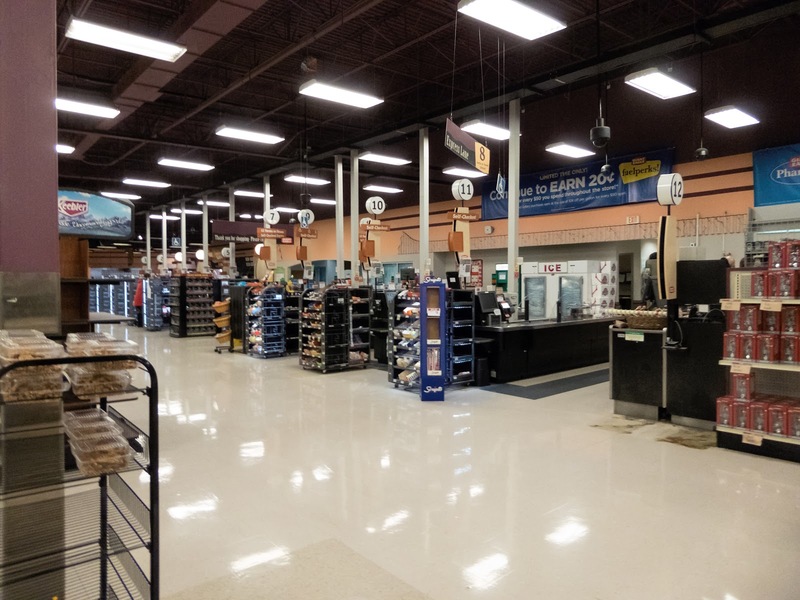 Finast / Tops floor tiles, freezers, and lighting; only the signs and refrigerator doors are different. 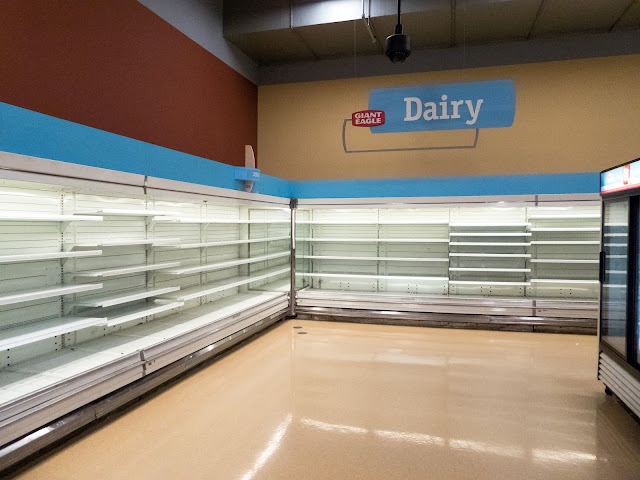 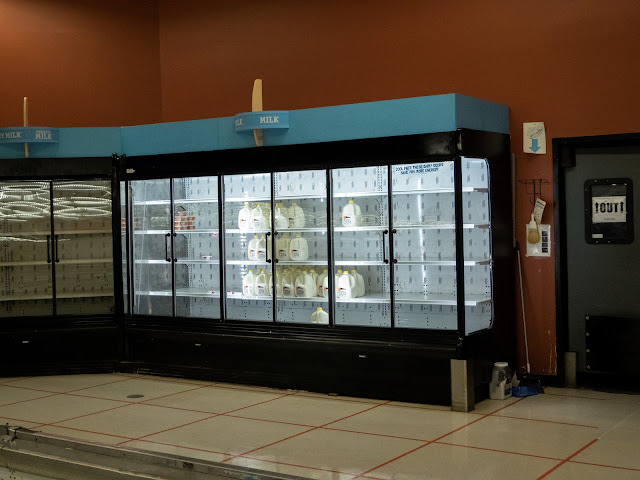 Giant Eagle has been adding doors to open dairy fridges over the last couple years. The front of the store... The bakery and deli departments are on opposite sides of the store, which was typical of Finast / Tops stores. 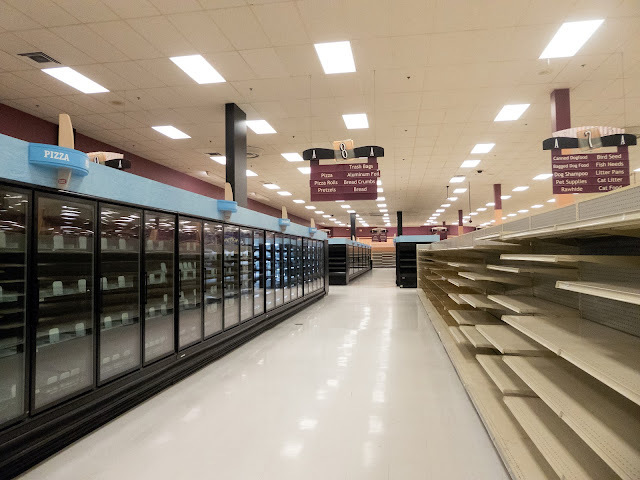 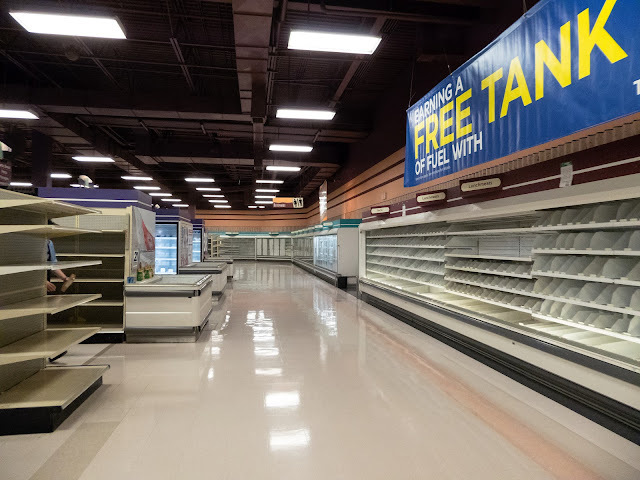 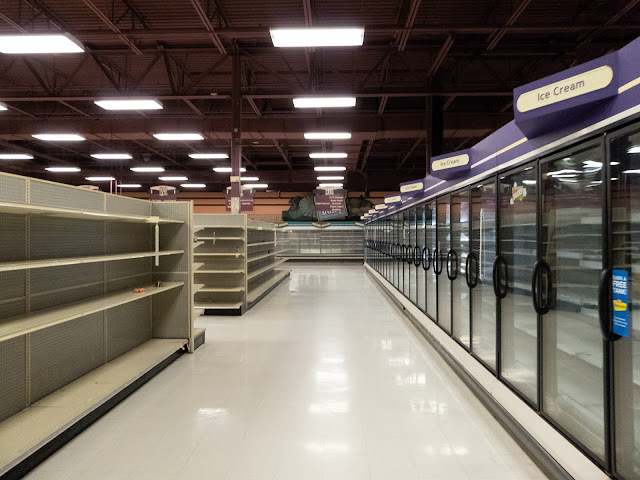 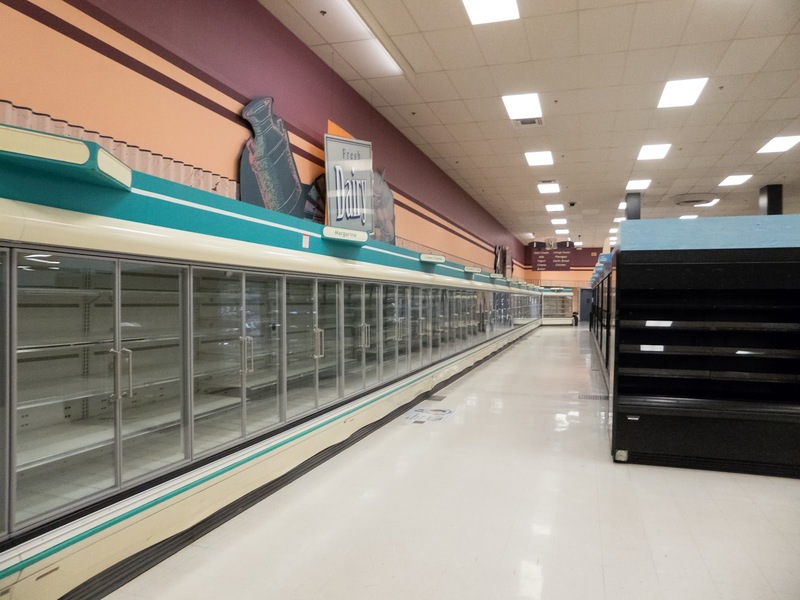 The fact that the open freezers were left this long, suggests that this store hadn't been doing well for quite some time. 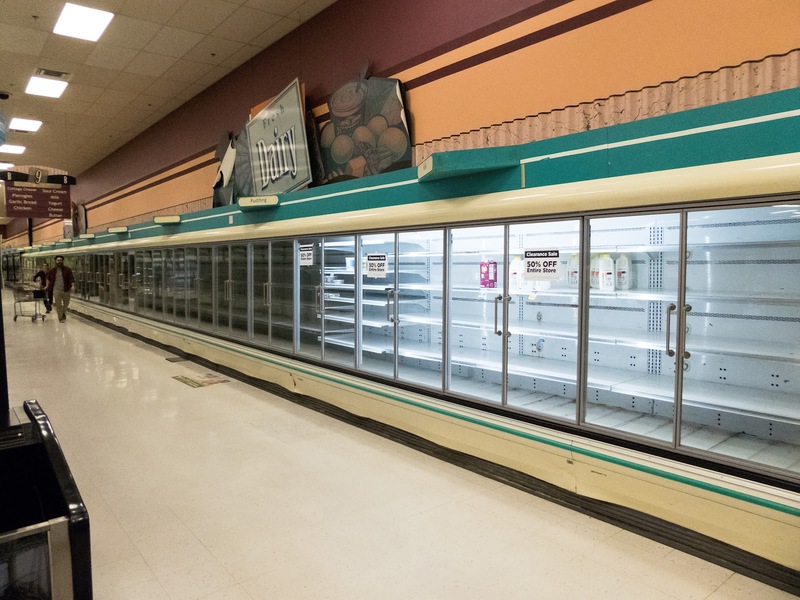 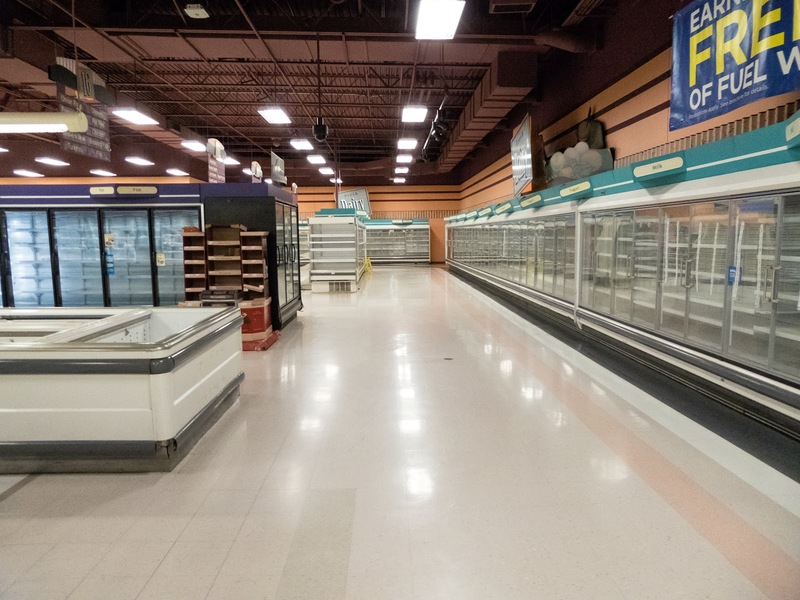 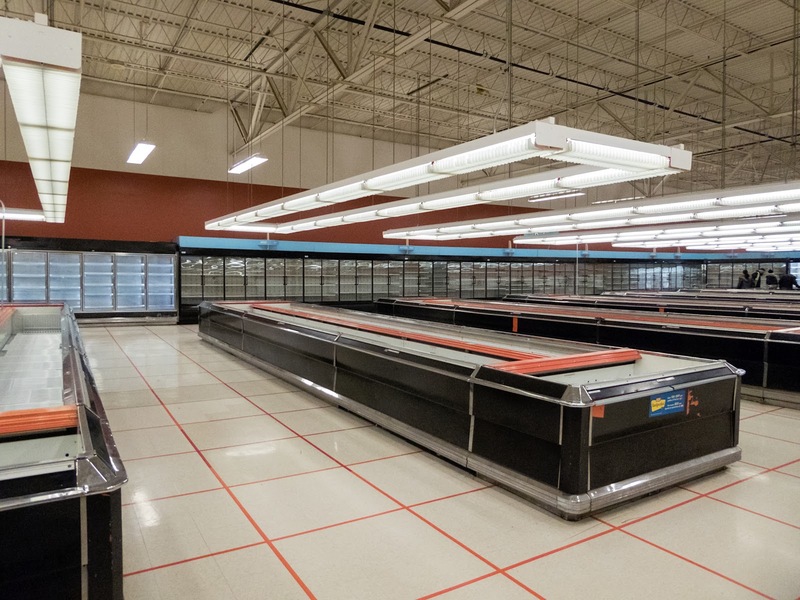 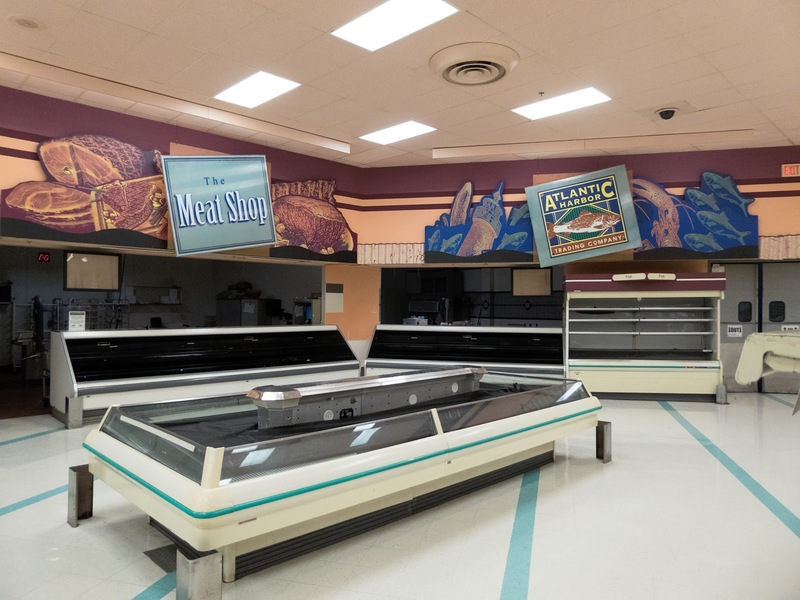 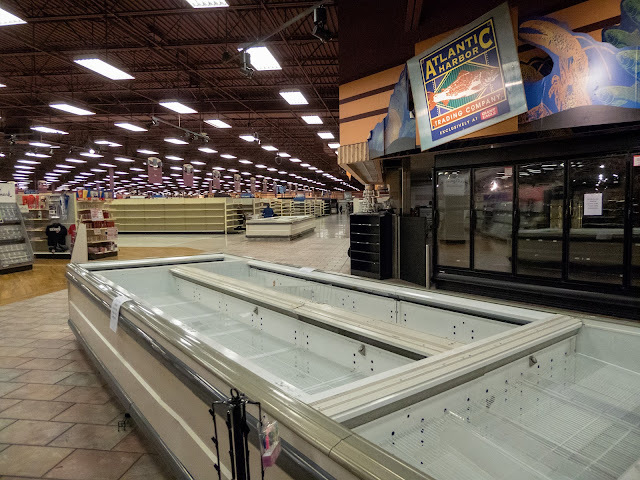 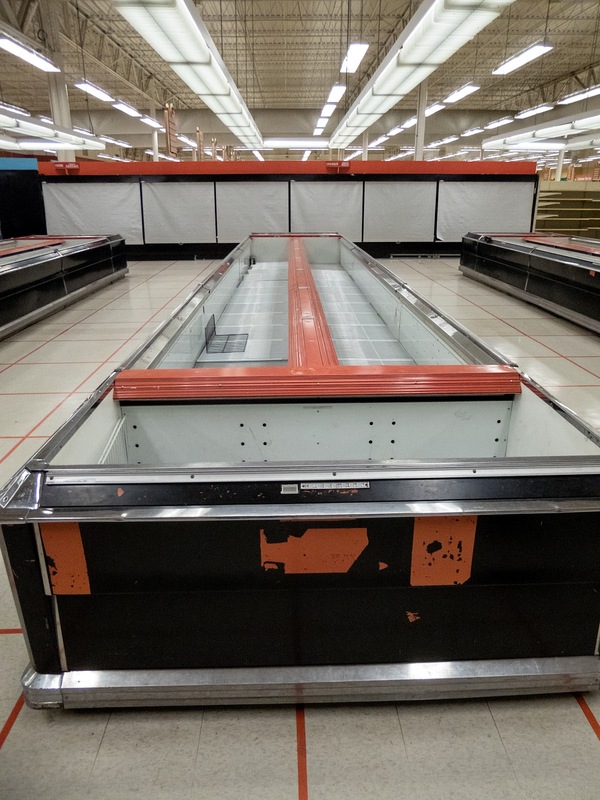 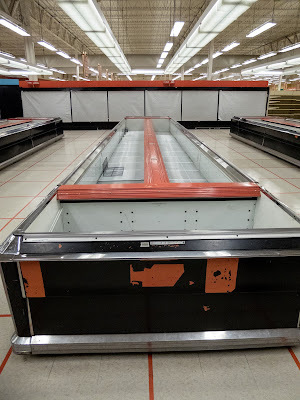 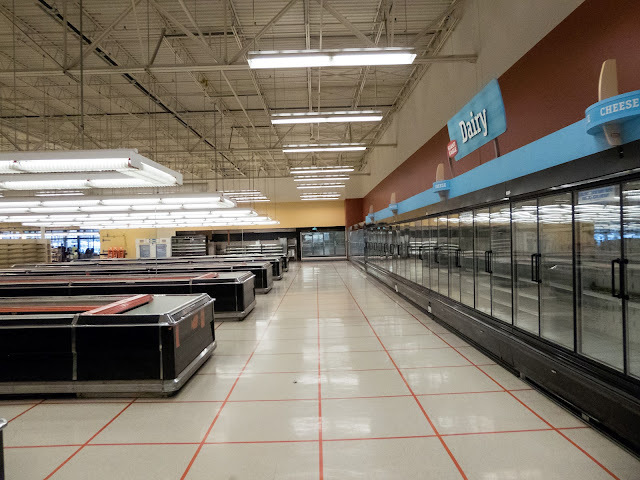 Even Royal Ahold, parent company of Finast / Tops back in the early 2000s, was working to phase out these open freezers before they pulled the plug on the Ohio stores. 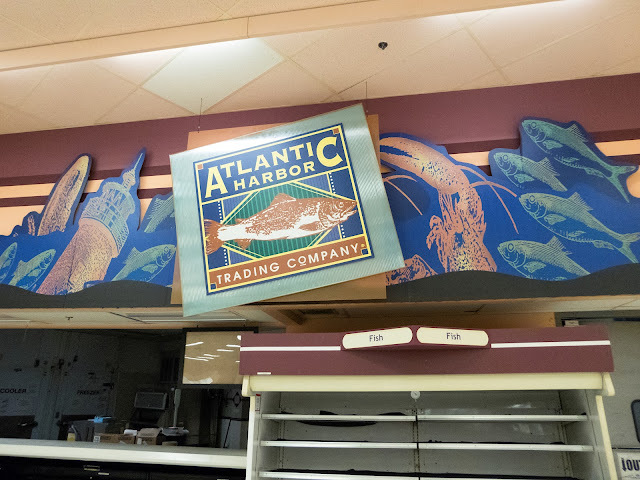 Seafood, The Kitchens, and the Deli along the back wall. 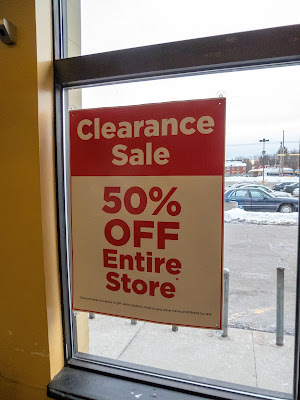 I am not sure when this store was opened originally. 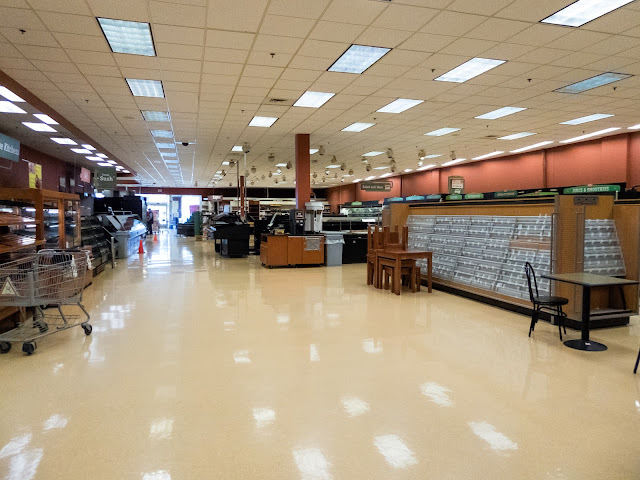 Aerial imagery from 1994 shows the store wasn't built yet then. This store must have opened right before or during the Giant Eagle acquisition of Rini-Rego (Riser Foods). 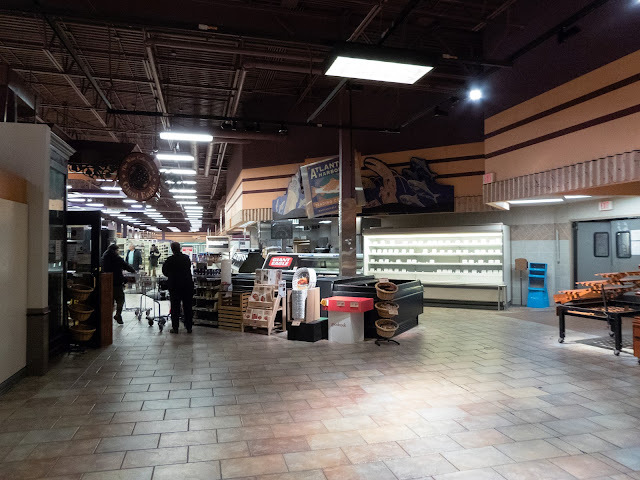 Lights like this over the produce and sometimes over the freezer section were typical of Rini-Rego stores. 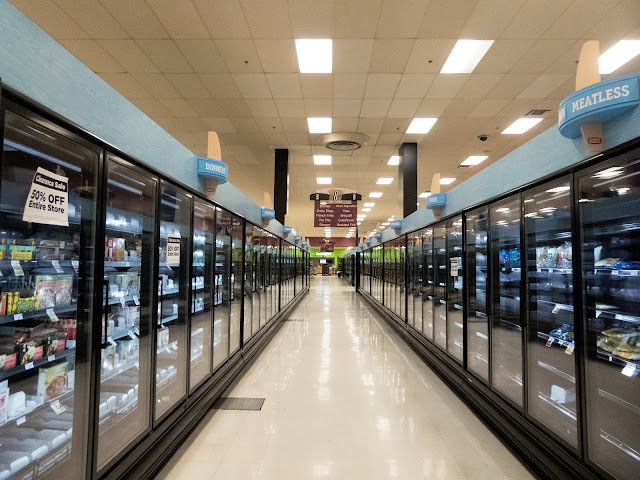 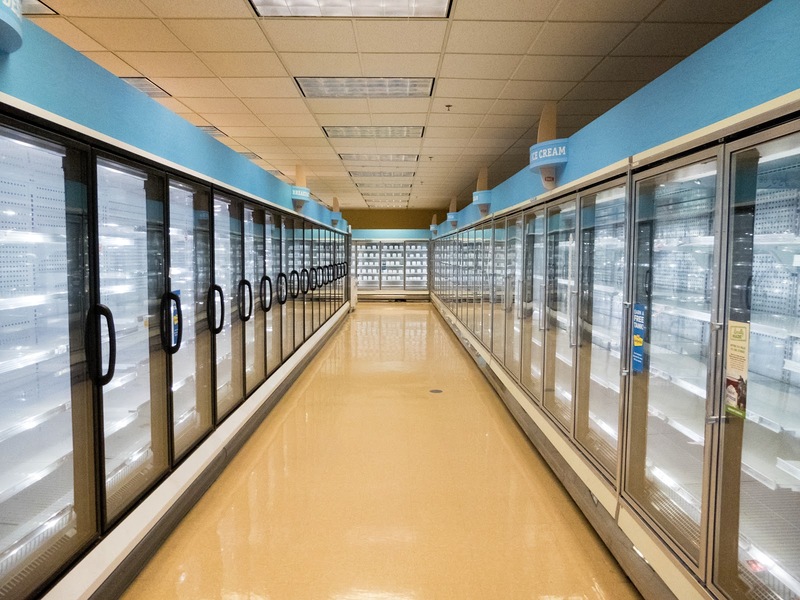 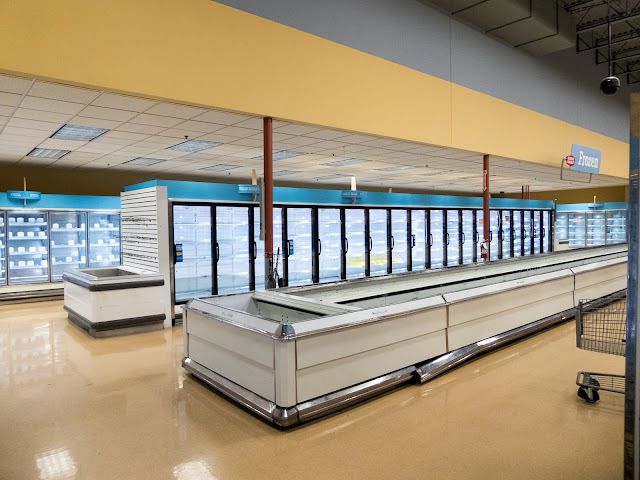 Freezers with doors at this locations! 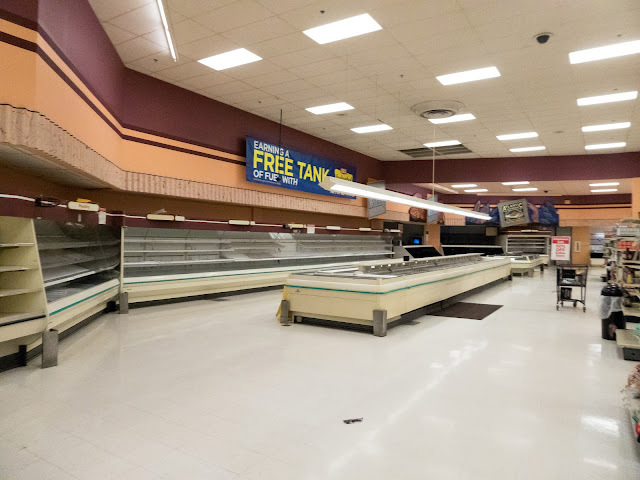 Rini-Rego and Stop-n-Shop locations generally would have had open freezers originally. 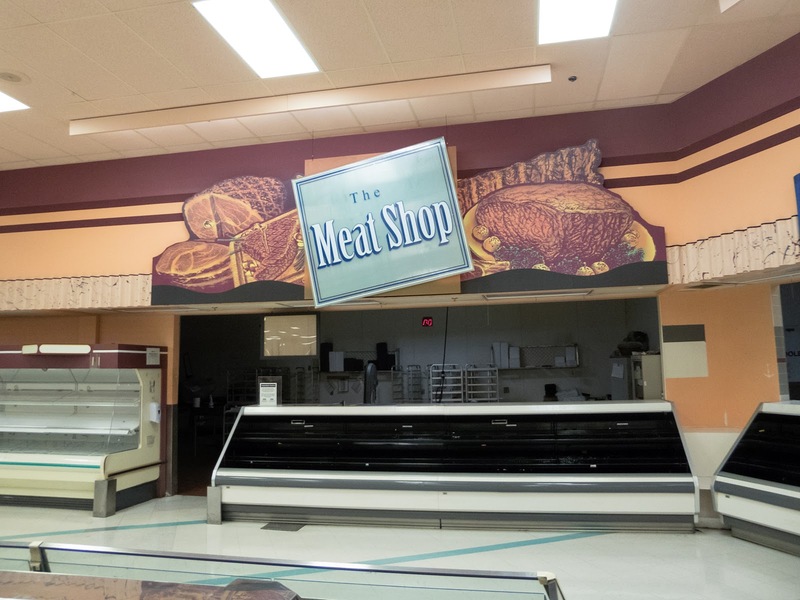 These look like a newer addition to me. 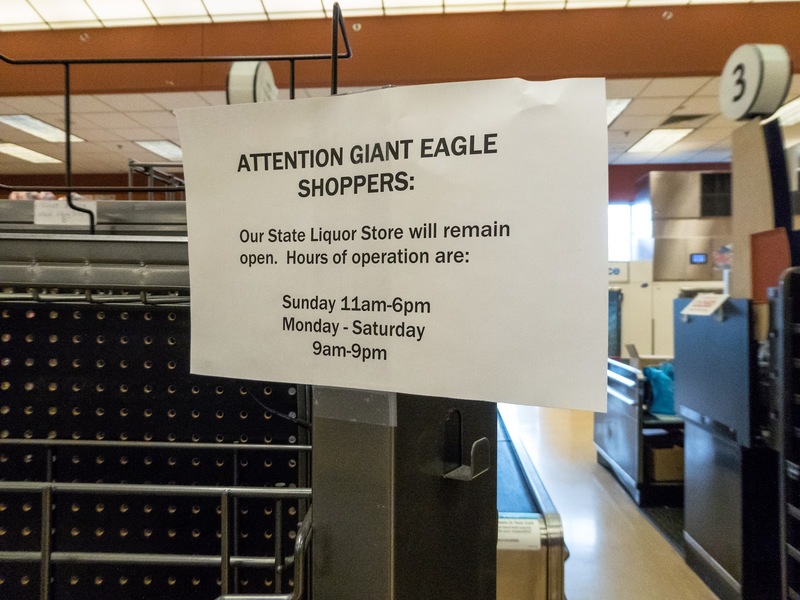 Signs are already down, but the cart returns still say Giant Eagle. 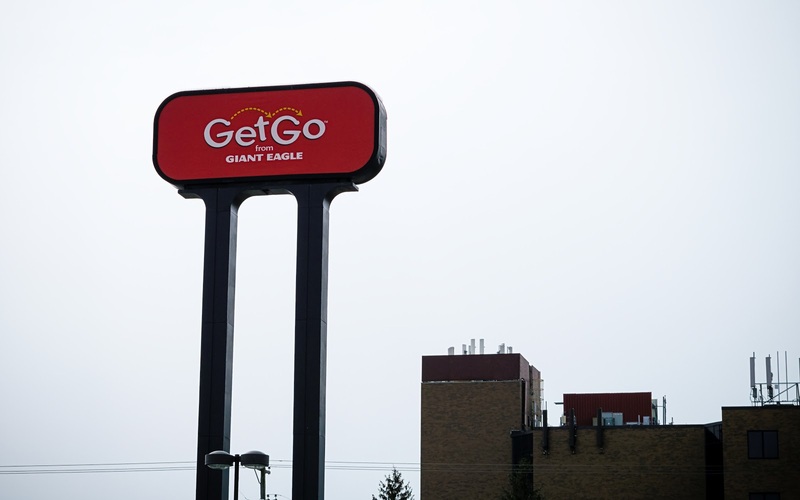 The GetGo gas station is staying open despite the main store closing. 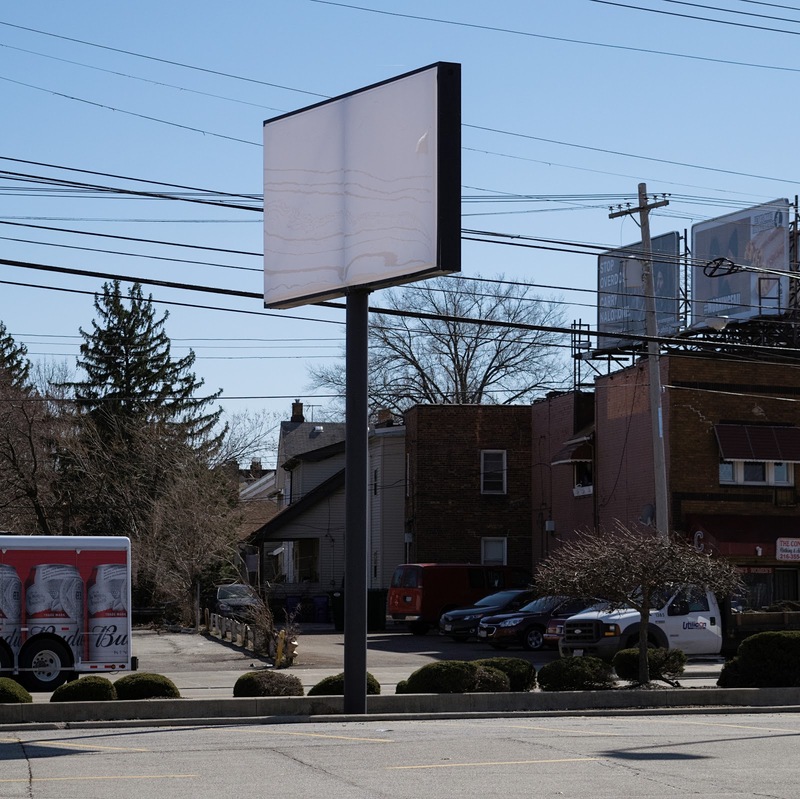 Site previously housed Hospitality Motor Inns. This is a large format late 1990s / early 2000s Giant Eagle design store. 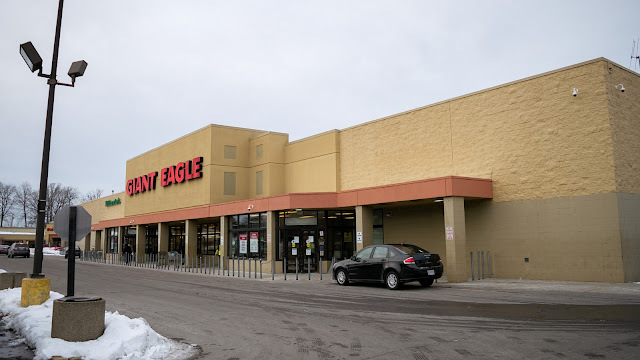 Newer Giant Eagle stores don't have the former Iggle Video canopy (to the far left) and generally have a secondary entrance right into the pharmacy area. 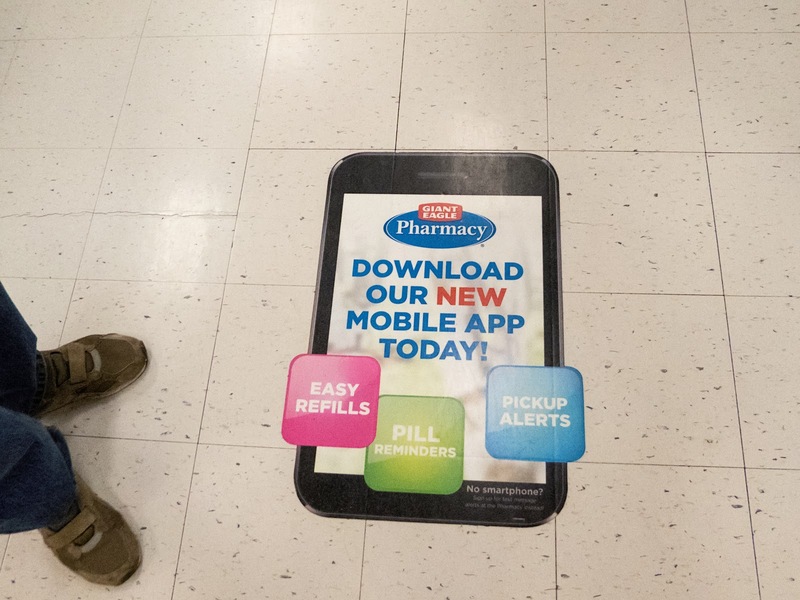 Stores that get the "health and wellness" update usually get a secondary entrance to the pharmacy as well; this store has not been remodeled since it opened. 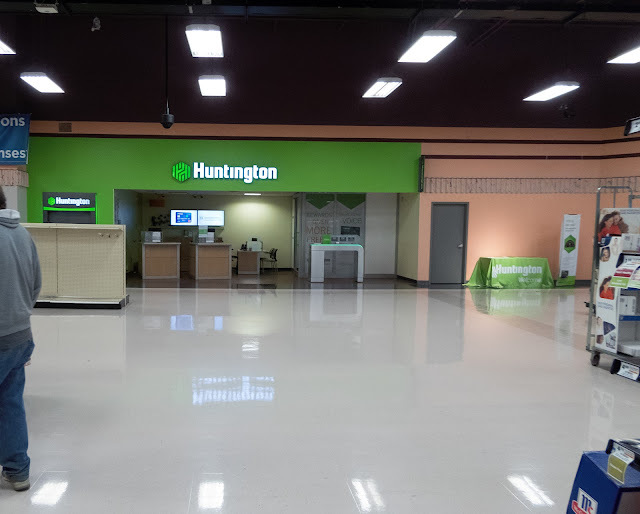 Some newer stores also get a more box-like main entrance rather than the typical one with the point on top. 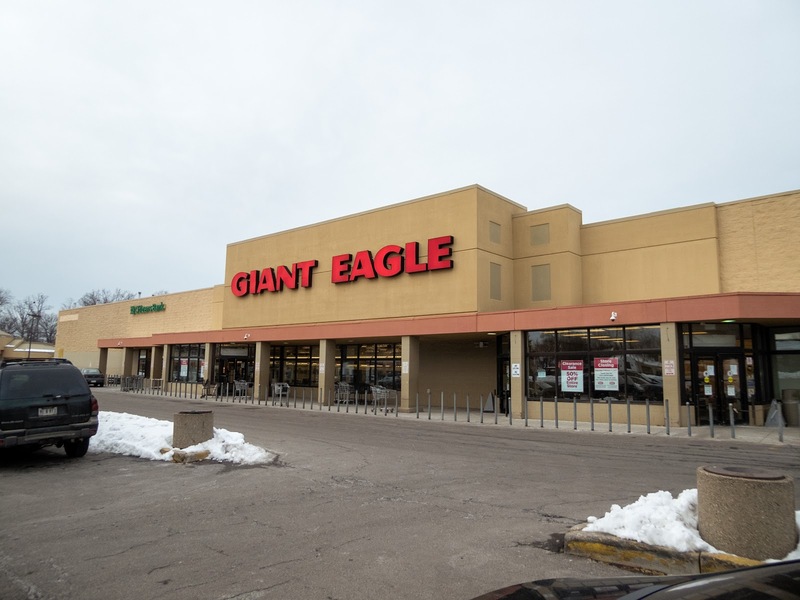 Unlike stores Giant Eagle has taken over from other chains, the ground-up built Giant Eagle stores tend to be much larger. 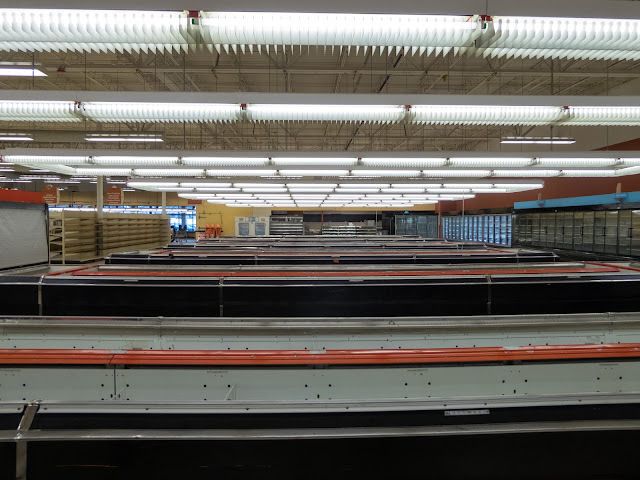 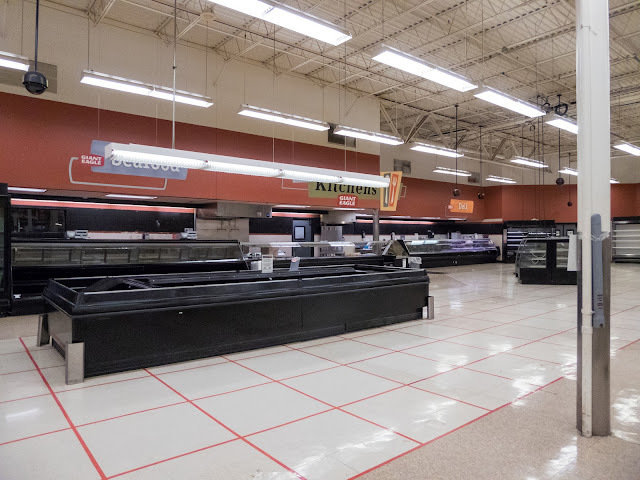 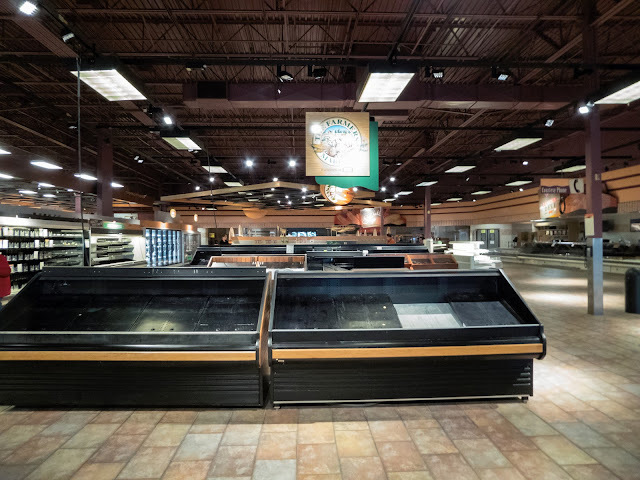 Even among Giant Eagle stores, this one was quite large at over 110,000 square feet. 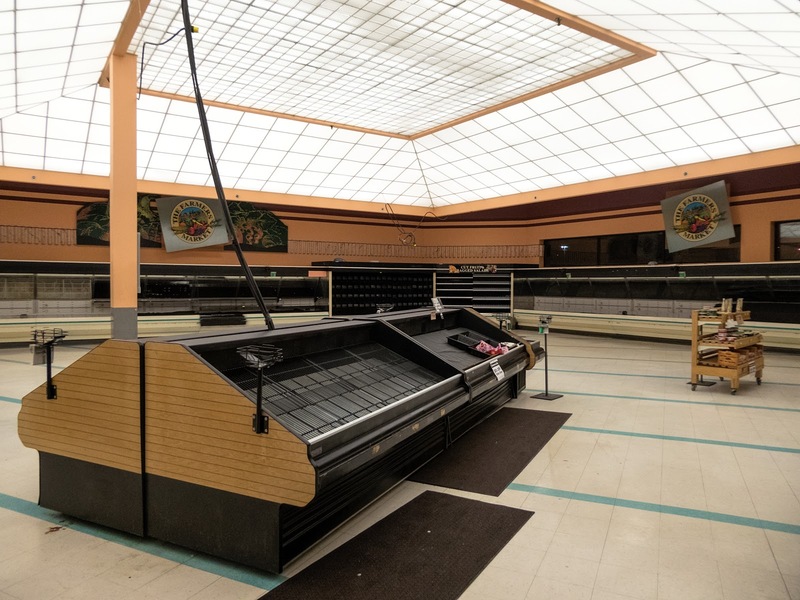 It even ran larger than most Market District stores. Some of these large format stores have been downsized (i.e. 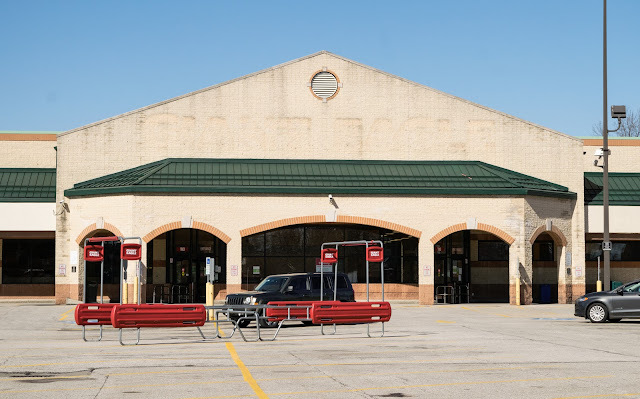 Lewis Center, Ohio) or converted into Market District stores. 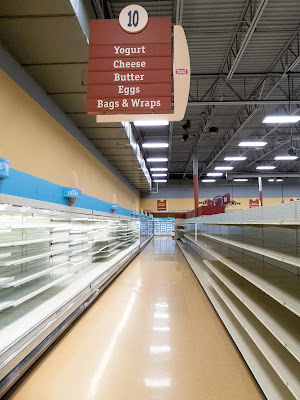 The area around this store seems to be mixed in how it is doing. 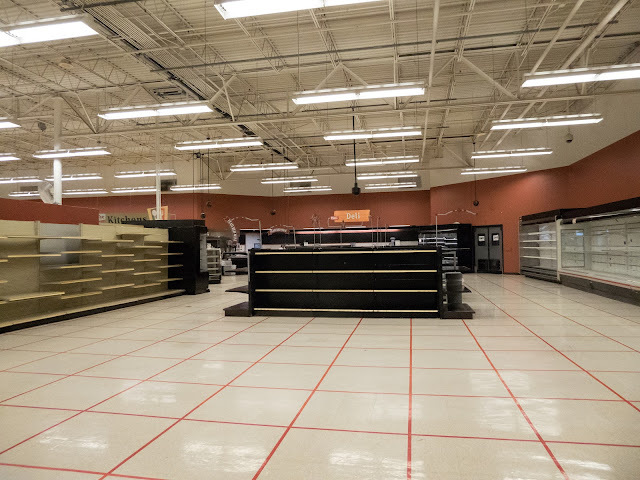 A new, slightly smaller, Kroger store opened a couple miles away on Morse Road in October 2016. The area directly around the store seems littered with abandoned hotels and some hotels being worked on to reopen. Columbus has been very aggressive at shutting down and boarding up hotels known for prostitution and drug use, especially directly around this Giant Eagle store. 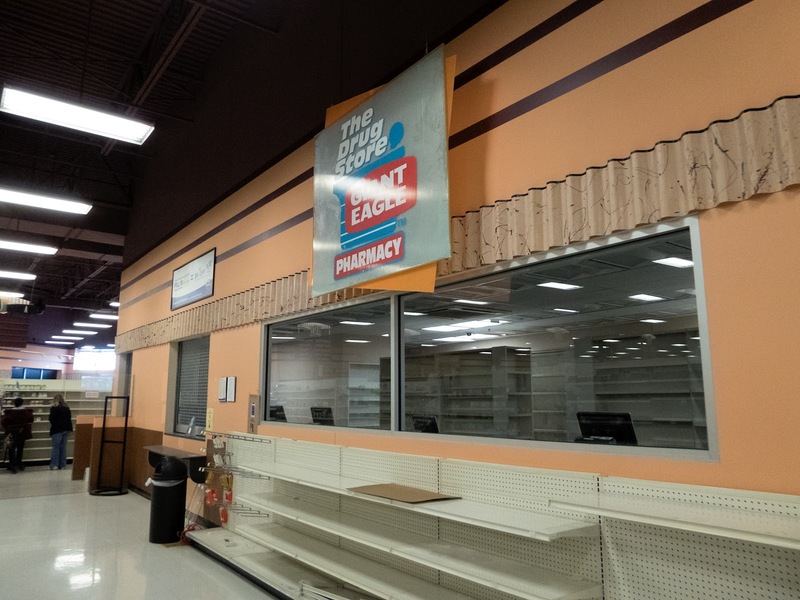 Also, a lifestyle center called "The Continent" behind the Giant Eagle store seems to be very empty and falling more into disrepair. There is also a pretty big retail desert a couple miles to the east on Dublin Granville Road, with a closed Meijer (being turned into bank offices) and several mostly empty shopping centers. 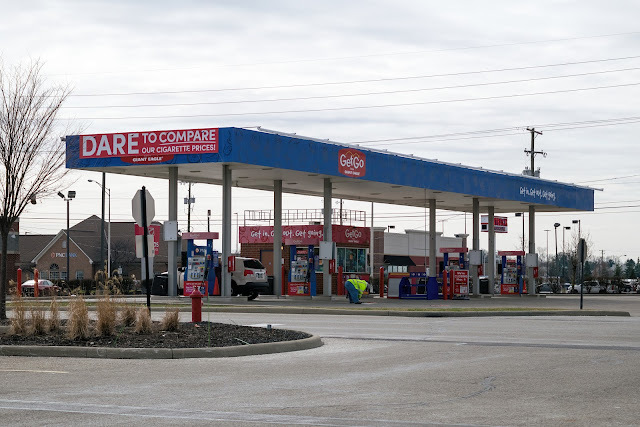 Of course Interstate 71is very close to the store and Dublin-Granville Road seems heavily traveled. An older kiosk-style GetGo gas station. 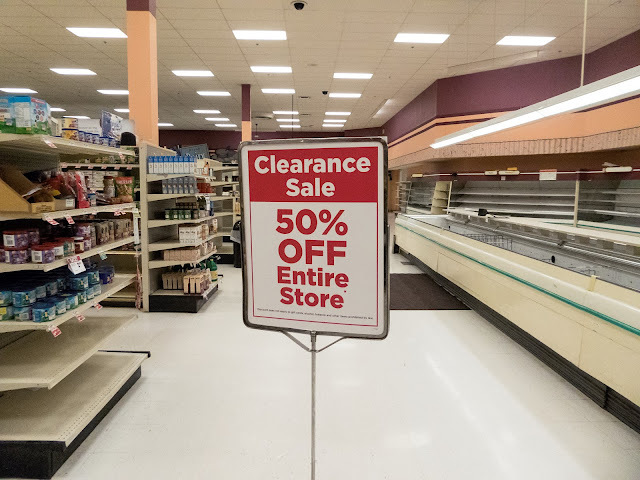 This was not listed to be closing. 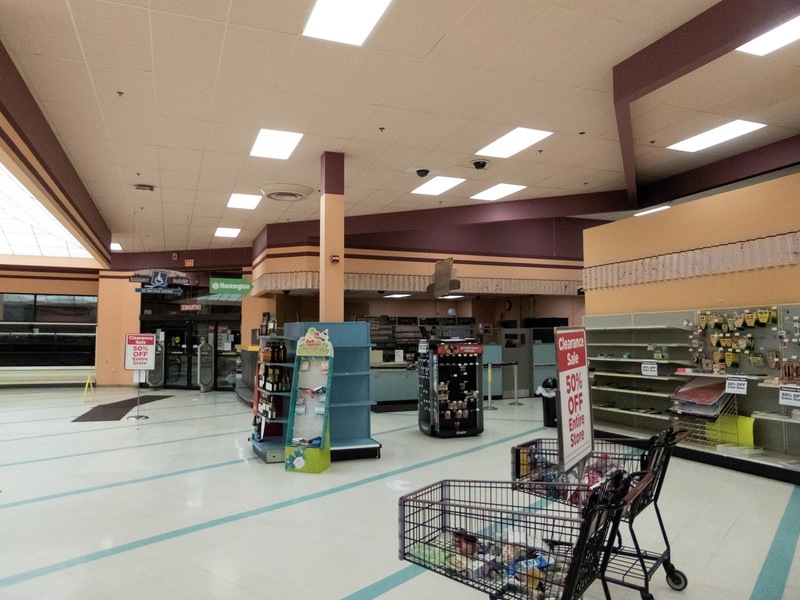 I imagine if there are plans to keep this open long-term, a convenience store will be added in the near future. One of the unusual things I noticed about this Giant Eagle is how there was an exit door in front of the registers (visible in this shot under the canopy to the left). 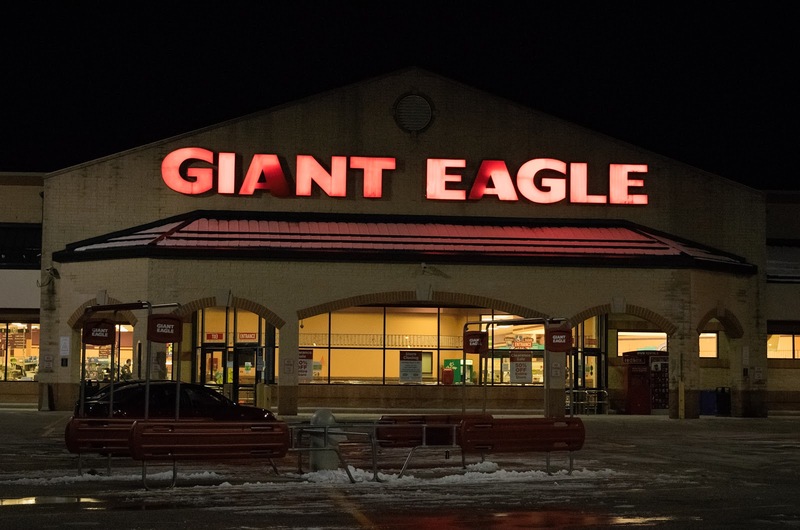 Most Giant Eagle stores of this design have people that checked out leave through the main entrance. 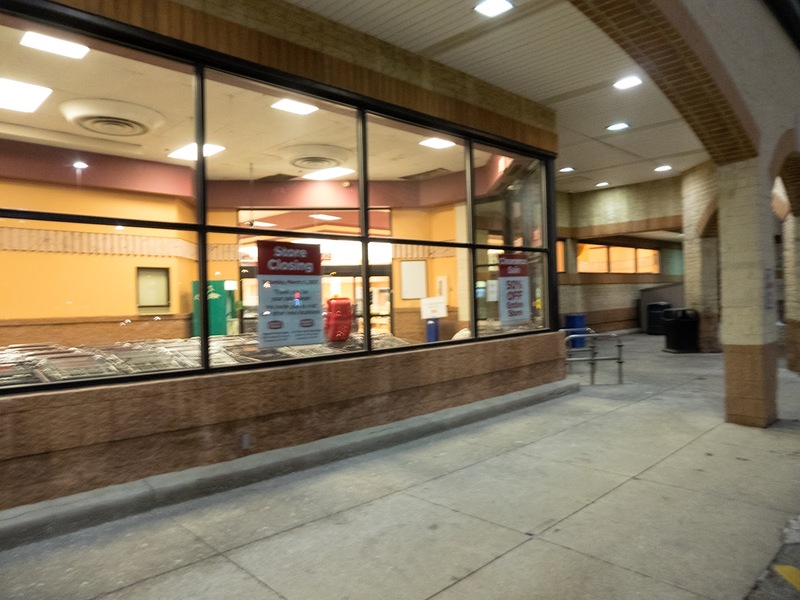 There is also a large entrance directly to the cafe (on the right), which I don't recall seeing at another store beyond a single pull door. 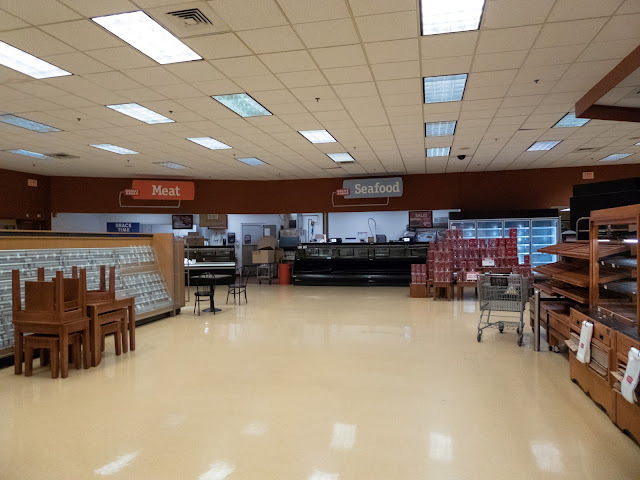 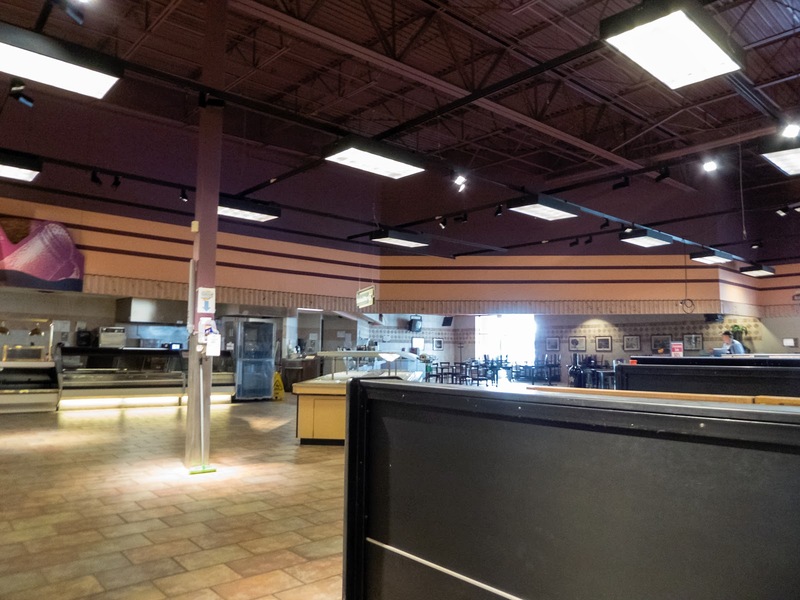 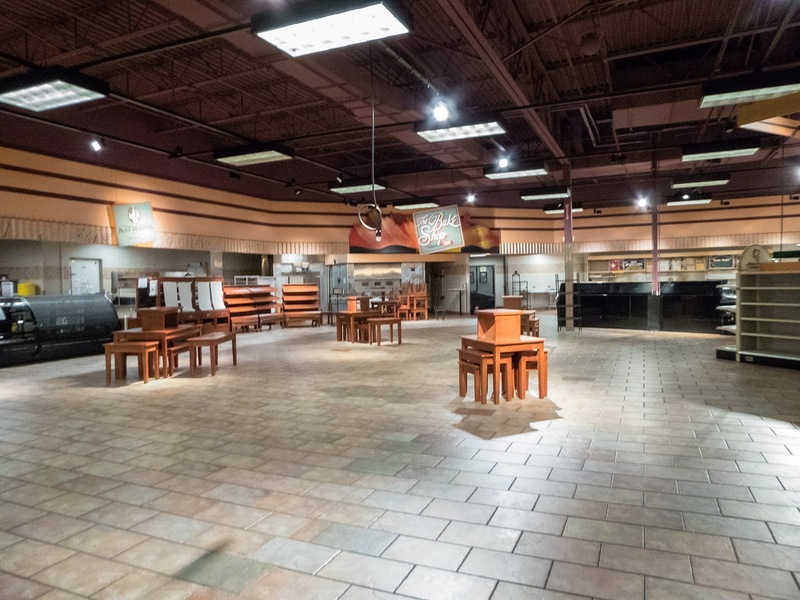 A fairly rare two-story cafe dining area in a traditional Giant Eagle store. 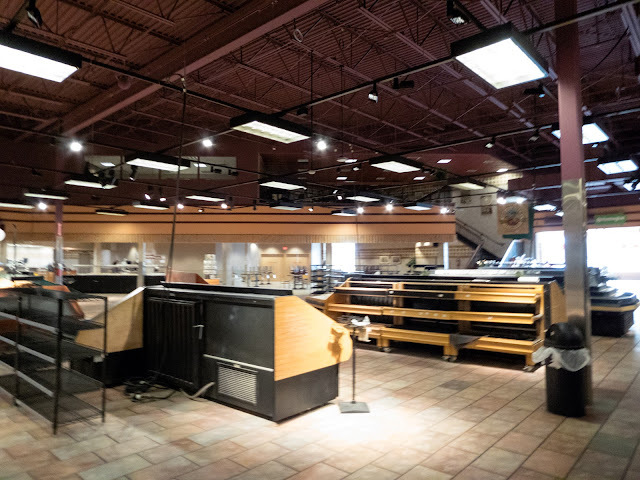 Some newer Market District stores have a two-story dining area, but they are not very common in traditional stores. Former Eagle's Nest child center. 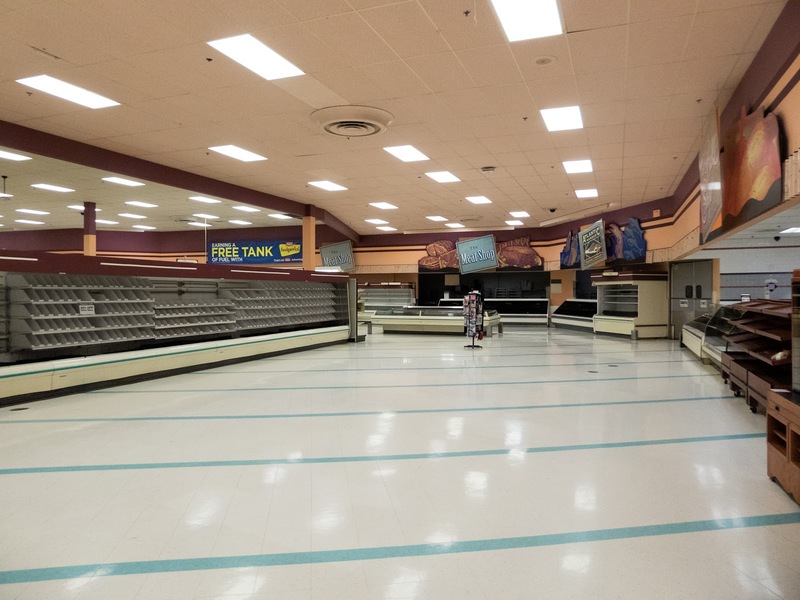 Most of these shut down a couple years ago, including this one. Some higher traffic locations still have them. Former Iggle Video space. 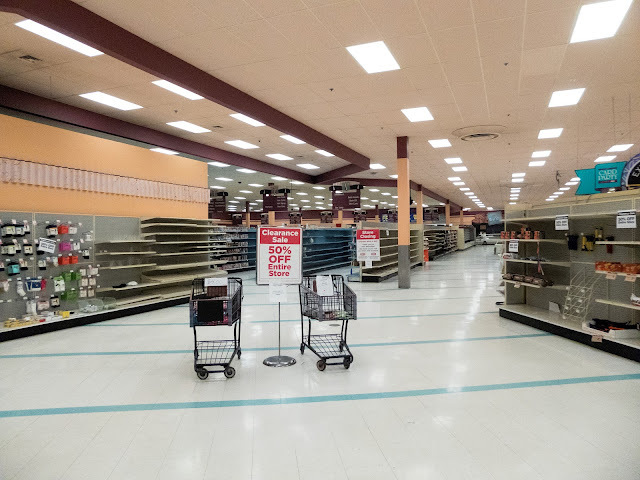 The video stores closed around 2007 or so. 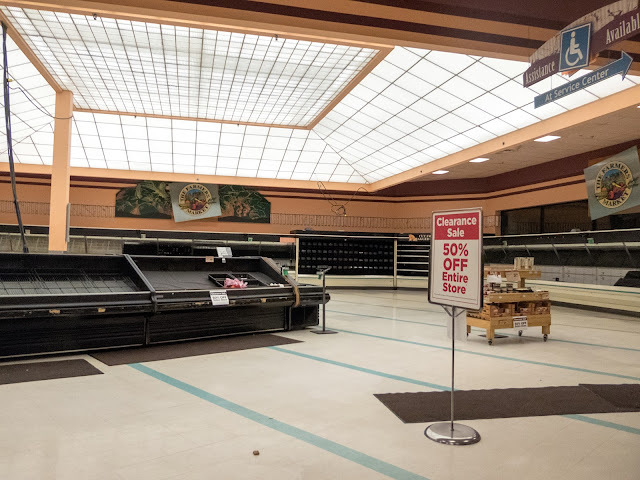 The now defunct Big Bear grocery store chain had a long history behind this location. 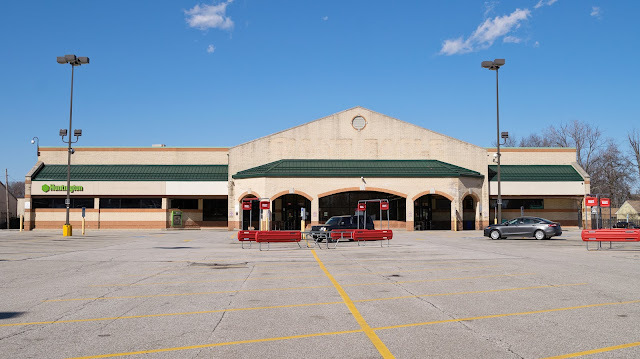 The third relocation of Big Bear store number 3 was ran on this site from October 31, 1962 to December 9, 1994. 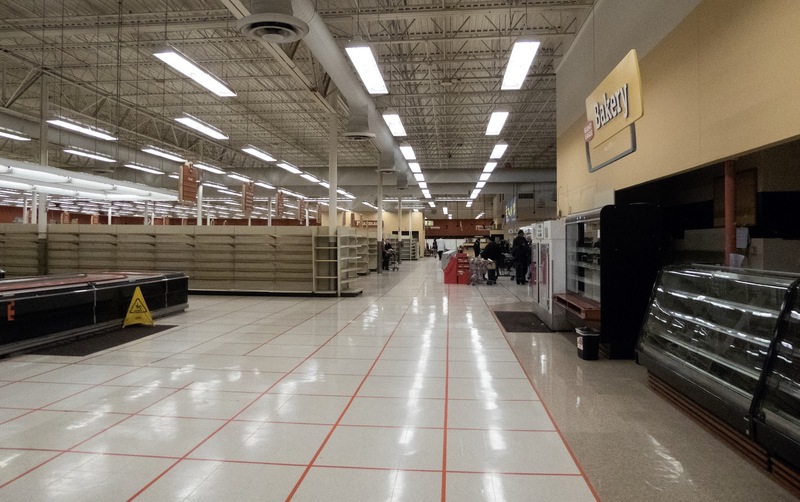 This newer Big Bear store (#220) was built adjacent to the old one in 1994 so as not to interrupt operations. 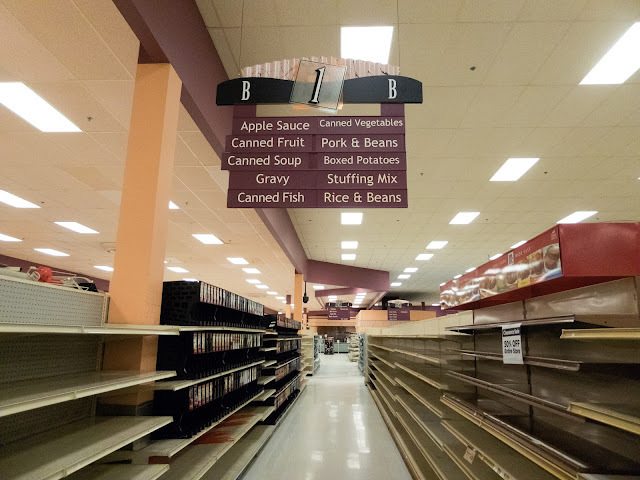 This store operated as Big Bear until the chain liquidated in January 2004. Typical Big Bear store entrance. 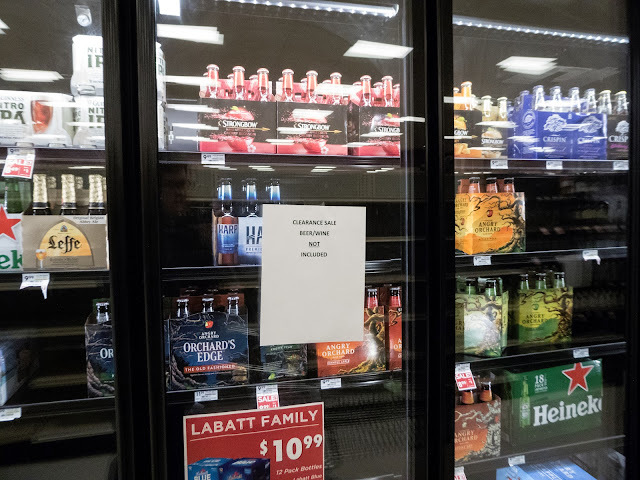 A Big Bear logo would have been on the other side of the glass. 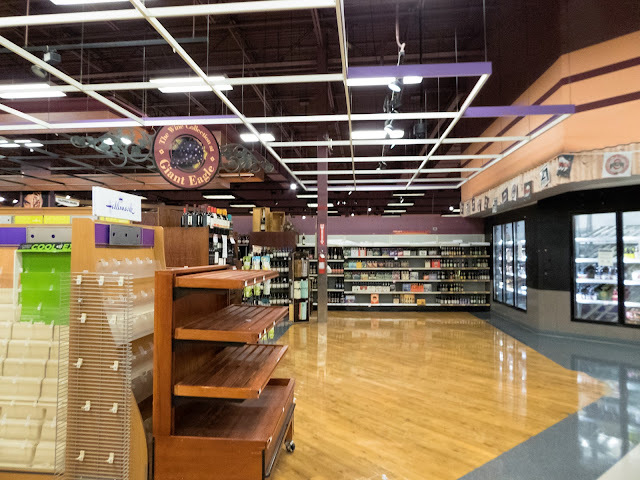 A lower ceiling in this area. Big Bear stores usually had varying ceiling heights and types in different areas of the store. 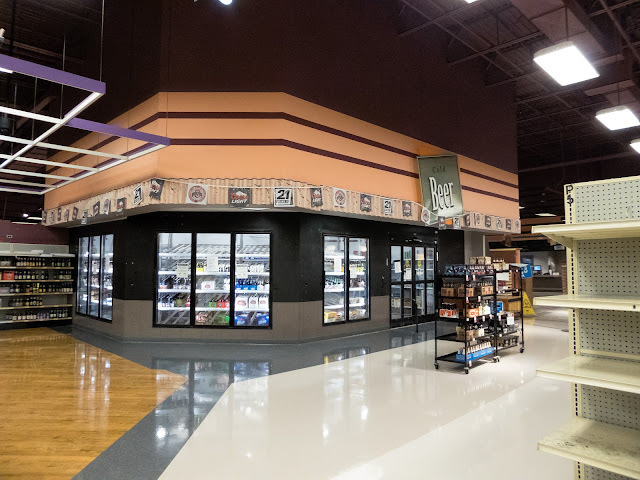 The decor in this store is from the mid to late 2000s, similar to the earlier Buckeye Road store in Cleveland. 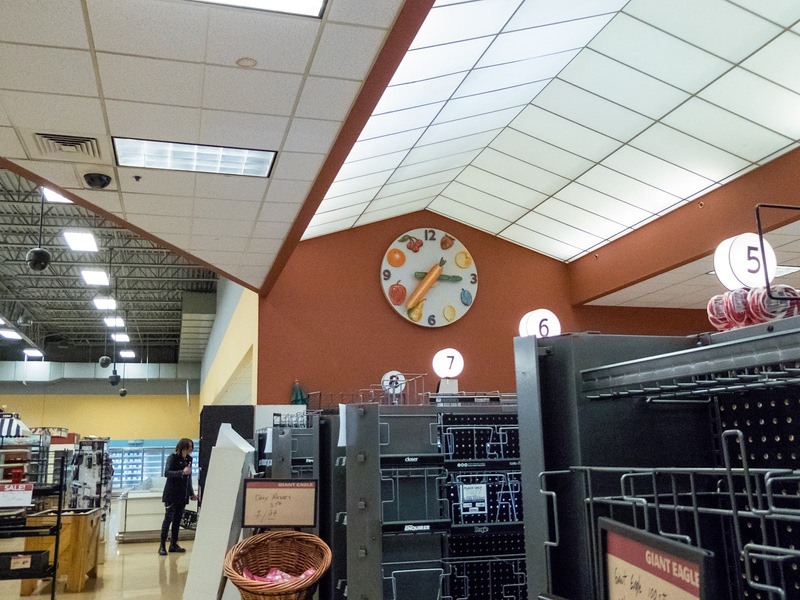 I am not sure what is with the low ceiling here. 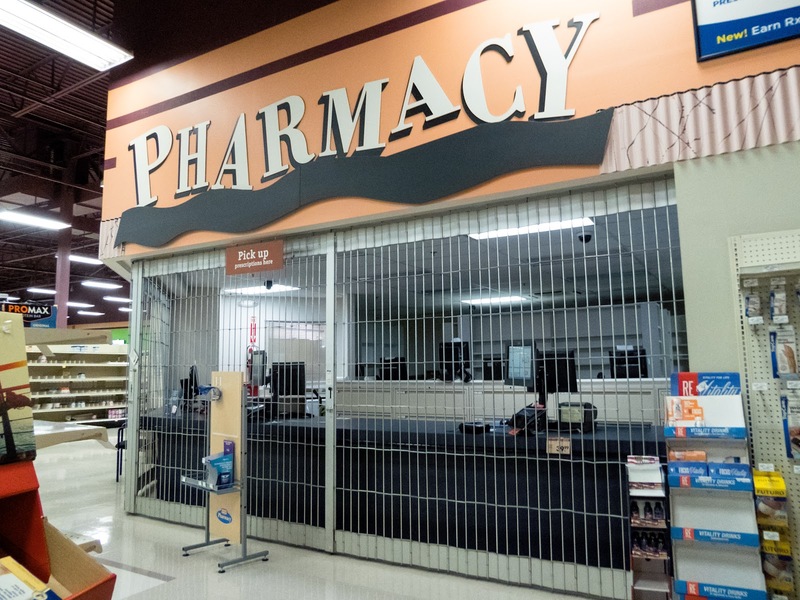 Maybe this was a Pharmacy at one time? 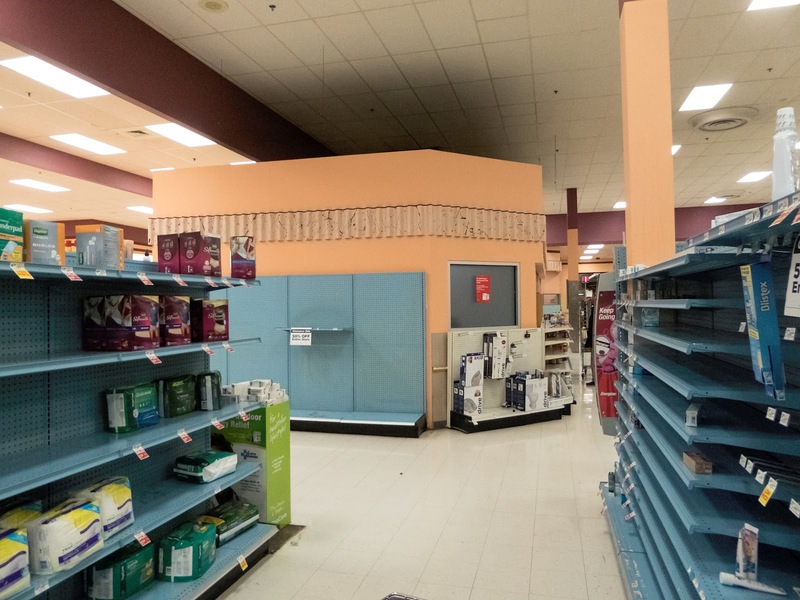 The store was lacking a pharmacy in at least its final years. 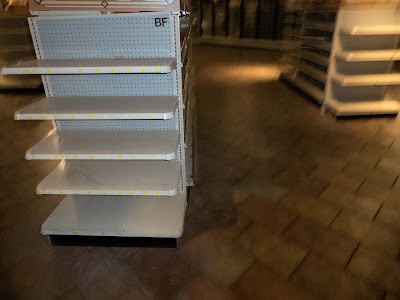 Most of the remaining Big Bear look was around the registers... Big Bear did this with lights over the registers. 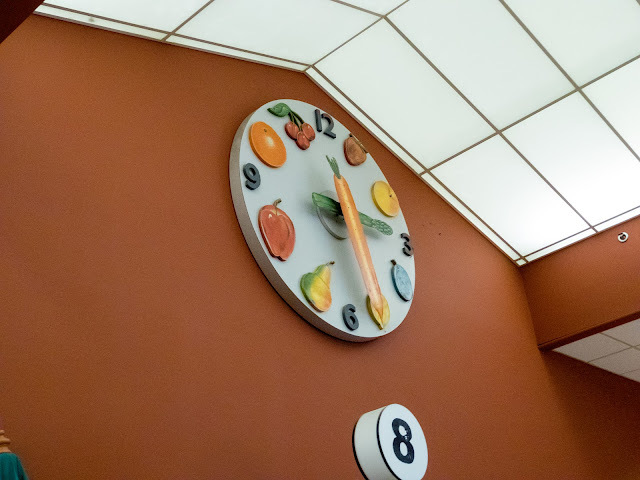 A Big Bear clock that didn't get ditched along with all the other Big Bear decor! It looks neat. 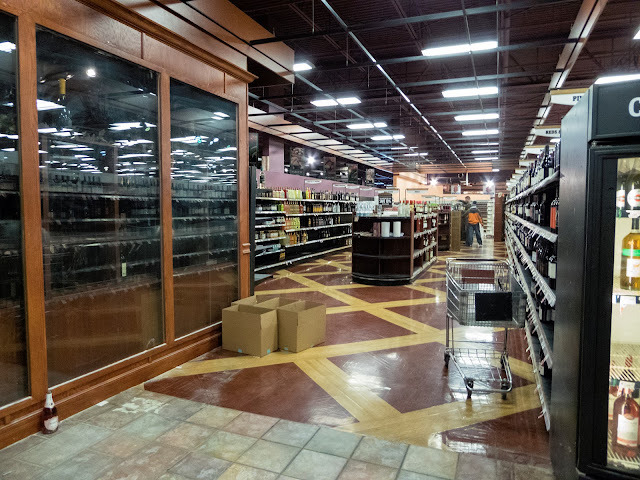 Updated video showing how the Neil Avenue store looks now that it was downsized into being only a liquor store. I believe this store is a casualty of both over-saturation of Giant Eagle stores and harsh competition nearby. 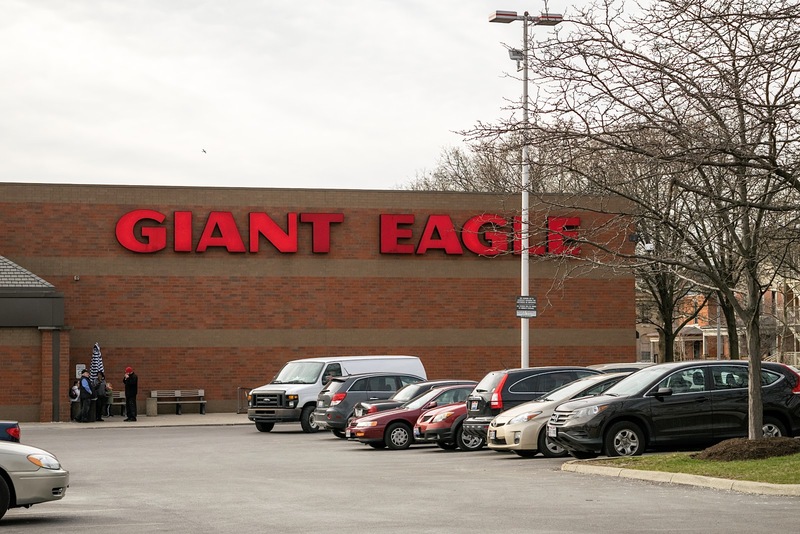 There are two Giant Eagle stores in a three and a half mile range, including a newer 92,000 square foot store opened in 2014. 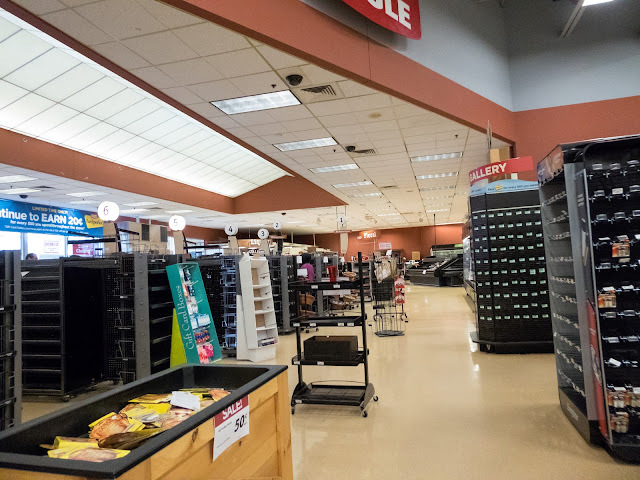 They could close this store and still have around the same number of customers located within a five miles radius of a Giant Eagle store. 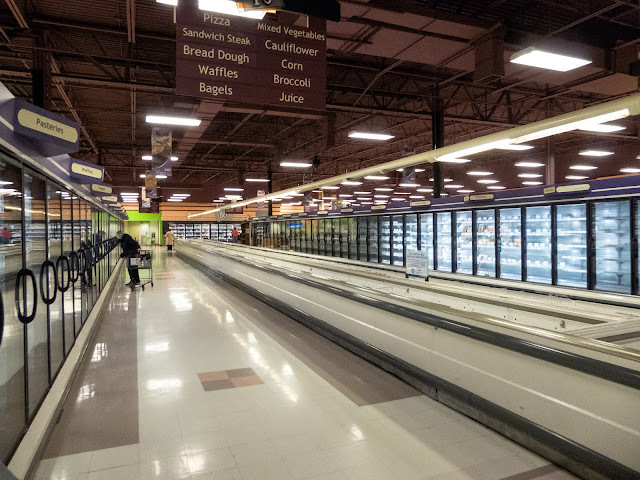 Also, within a mile of this store are various other stores selling groceries: Meijer, Walmart Supercenter, Kroger, Sam's Club, Target, and Gordon Foodservice. 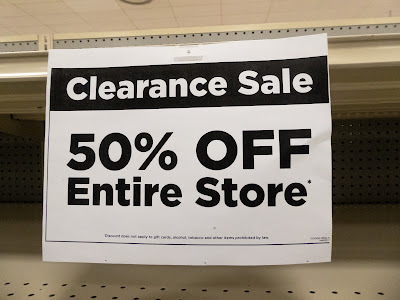 Thank you for viewing this post! I hope to be able to post more and update some more pages in the coming weeks. It has been a while since we posted on here. 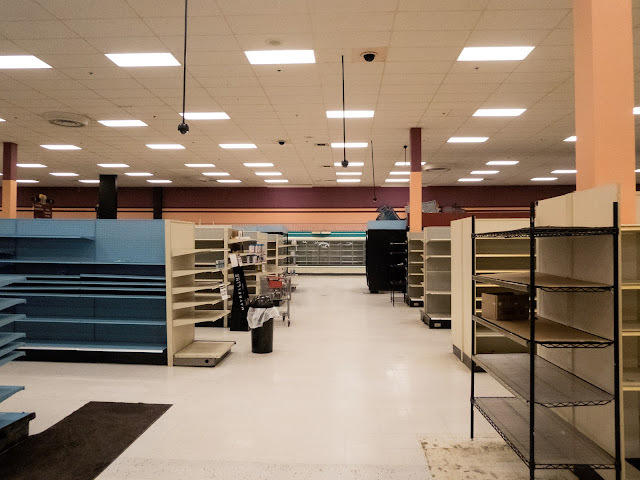 Be sure to check out the Dead and Dying retail Facebook page since that tends to be a lot more active.